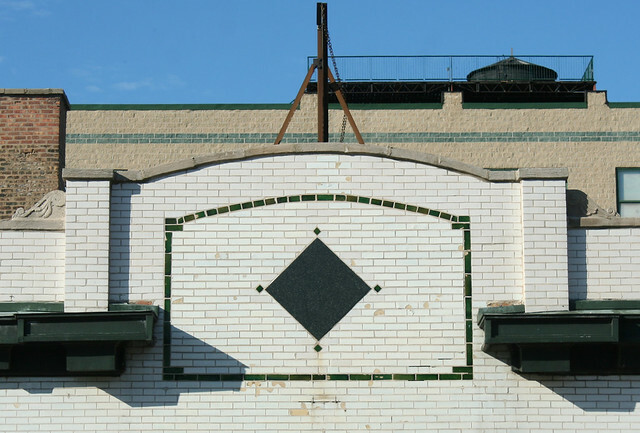 Another batch of white and green glazed brick storefronts – about a dozen total. 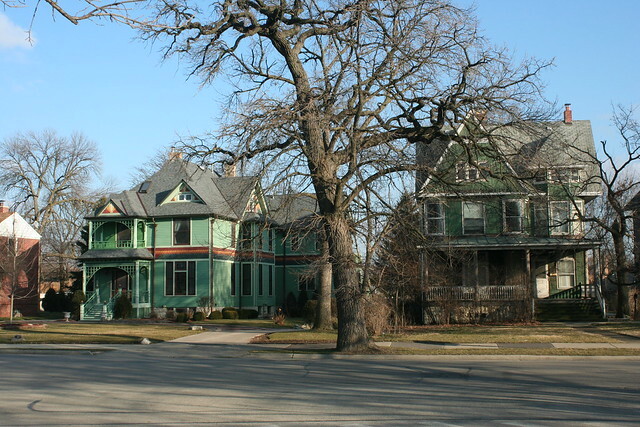 At this point I have documented well over 50 of these buildings in and around the city, all featuring the same material and color pallet, and often the same style of design and ornamentation. And still no answer to the simple question of why! Why this color combination, why so many of them, why this style, why right in this one concentrated time period around 1920? 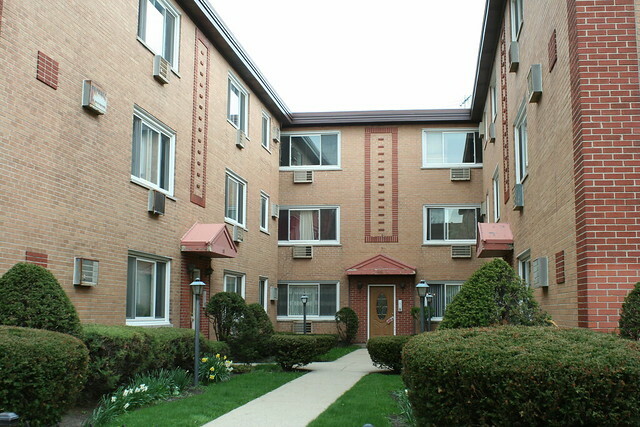 741-749 W. 79th Street at Halsted. 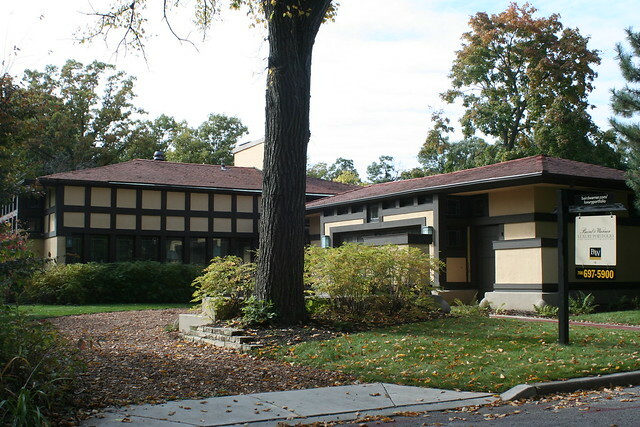 The westernmost of the four storefronts was the Auburn Park Library from the late 1930s until 1963. 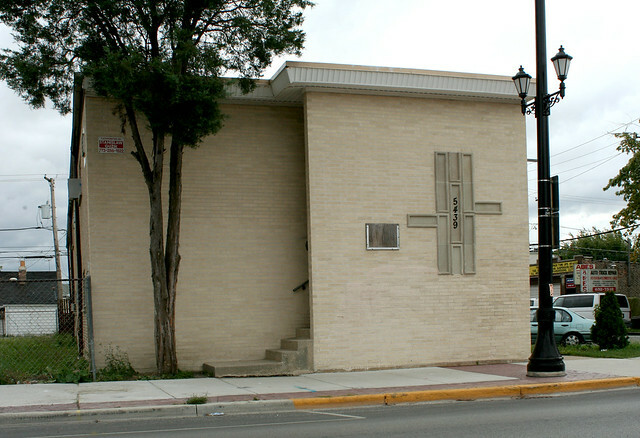 This building was next door to the corner commercial building demolished several years ago following a wall collapse. 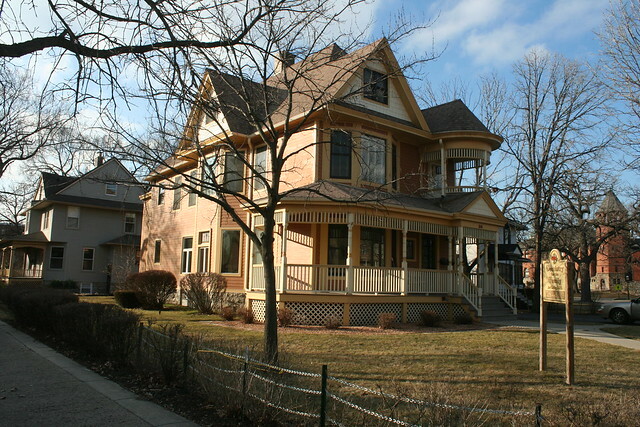 7051 N. Clark Street, Rogers Park. Originally the Casino Theater, one of a legion of early theaters, most of which lasted only a few years before larger and more modern competitors overtook them. 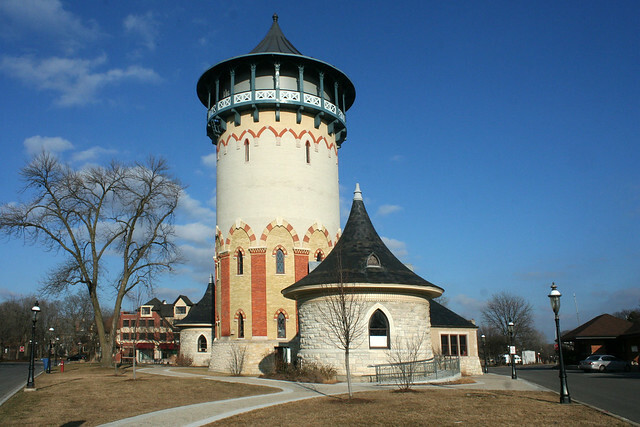 Cinema Treasures lists the Casino as operating from 1913-14; it was cited by the city in 1913 – along with dozens of other theaters – for a total lack of any ventilation. By 1919, it was a car dealership. 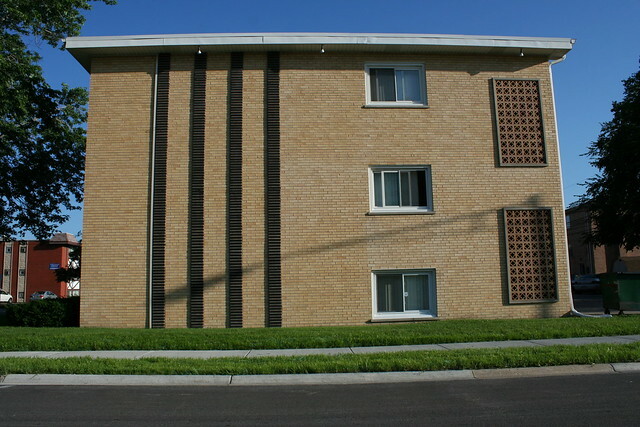 In recent years, the building has lost a curved parapet wall. 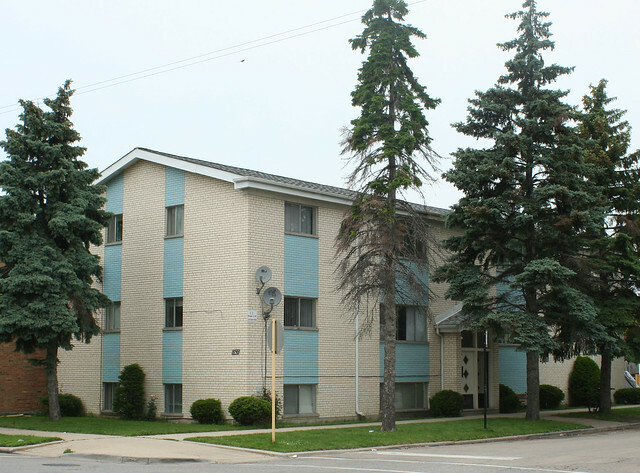 Before this building went up, the site was home to Patrick Leonard Touhy, an early settler, businessman and land trader in the area, who married the daughter of Phillip Rogers, platted Rogers Park, and lent his name to one of the area’s major east-west arterial streets. 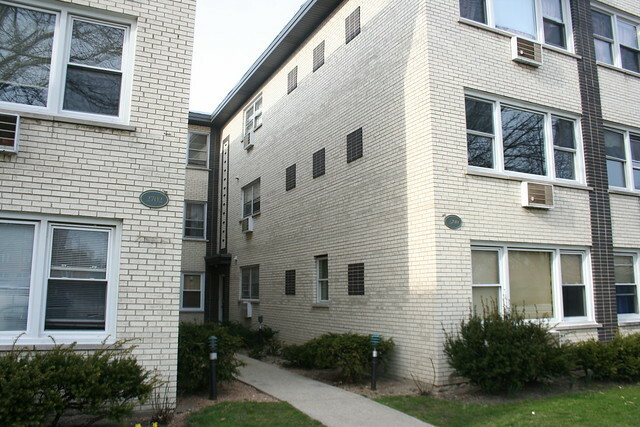 Separated from his wife, Mr. Touhy lived at this address alone until he passed away in 1911; his house was demolished and replaced with the theater. 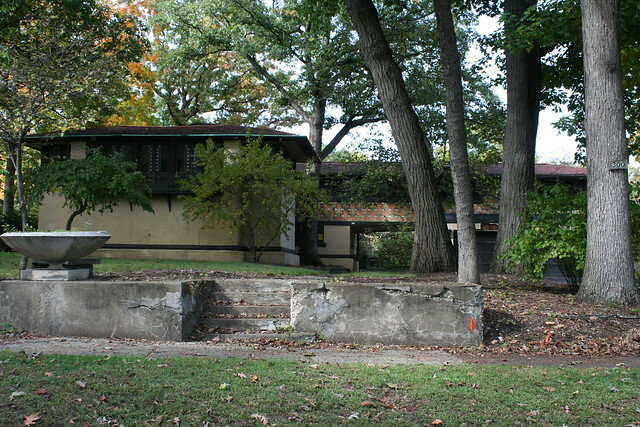 His wife’s mansion, at 5008 Clark (old system, 7339 Clark new system) was torn town in 1917 and is now the site of Touhy Park. 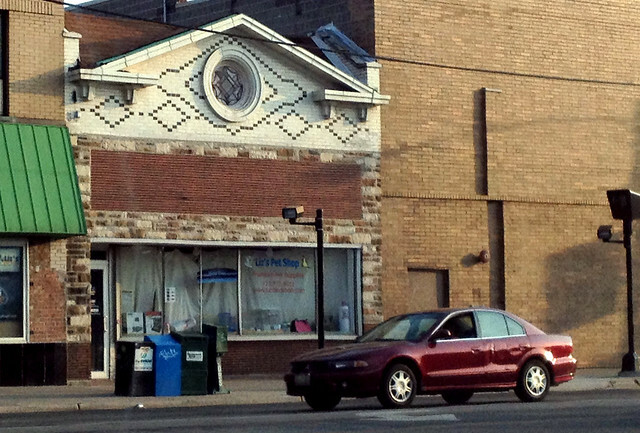 2403 W. Chicago Avenue – Liz’s Pet Shop, with thin triangular and diamond patterns surrounding a beautiful bulls-eye of stained glass above, and a completely altered storefront below. 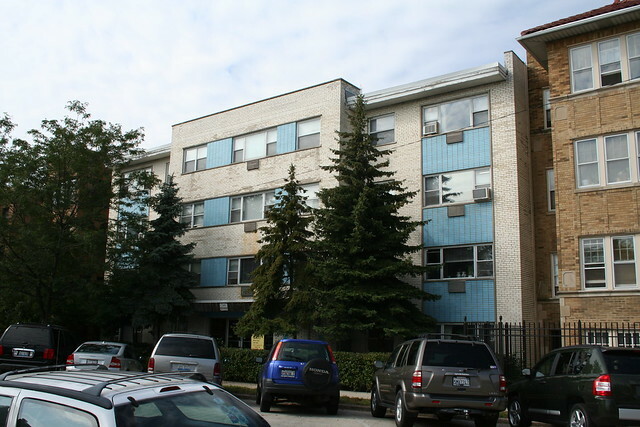 In the 1930s it was the office of Dr. Marco Petrone (1902-1966), a gynecologist and city Health Department inspector whose office also seemed to have a knack for attracting crime victims seeking emergency treatment. 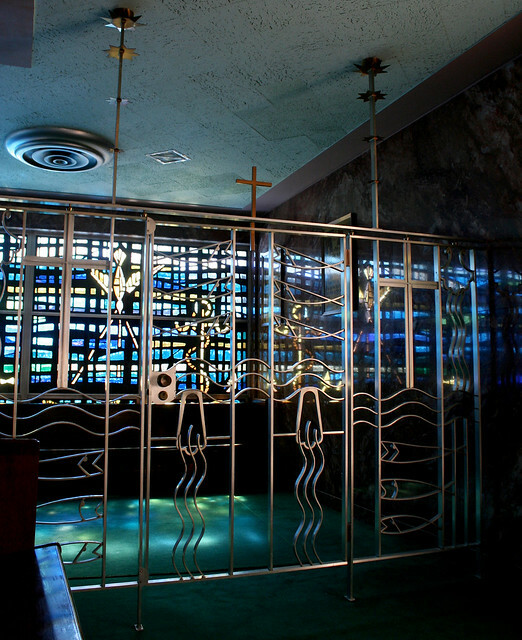 By 1945 it housed the Roncoli Grill. 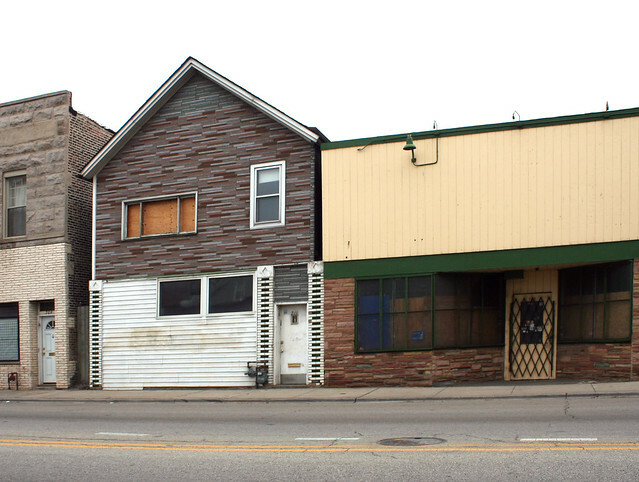 4230 1/2-4234 and 4236 S. Archer Avenue – two adjacent buildings with matching facades. 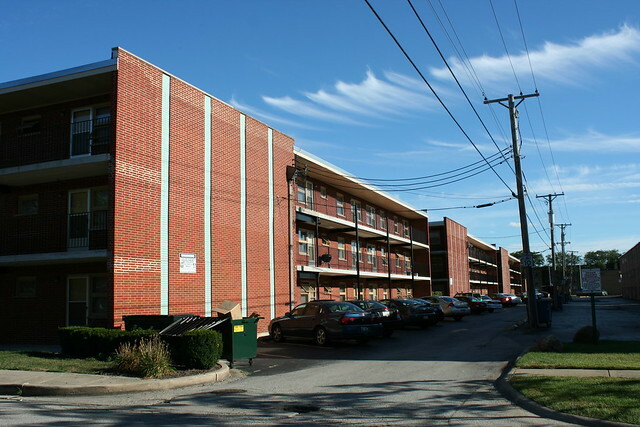 The lower, longer building on the right contains three retail storefronts; the peculiar 4230 1/2 address indicates that the third was shoehorned in at some point. 4234 was a Brighton Hobby store in the 1970s; recent occupants include the recently departed Vision To You, a pizza parlor, and a salon. 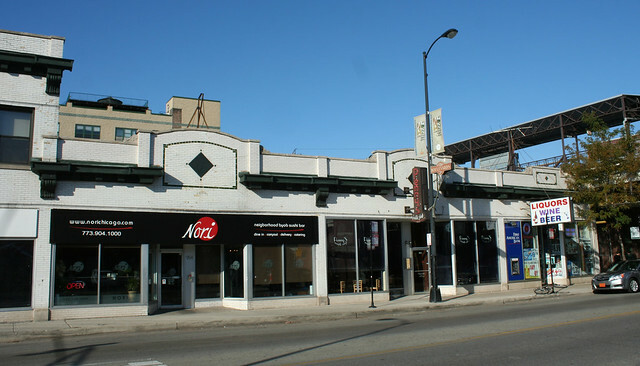 4236 S. Archer opened as the Crane Theater in 1916 – hence the grand archway; it operated as a theater into the 1950s. 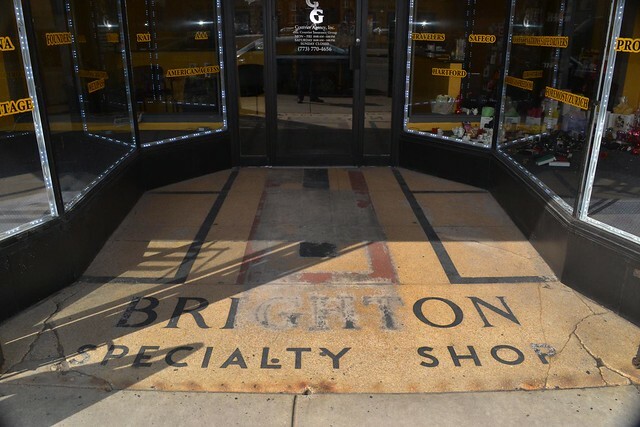 More recent retail tenants included a Color Mart wallpaper store in the 1970s, the Brighton Flower Shop until around 2007 (with a great neon sign), and the China Spa in 2008. Both stores were refaced with modern red brick recently, first the theater in 2012 and then the storefronts on either side in 2013. 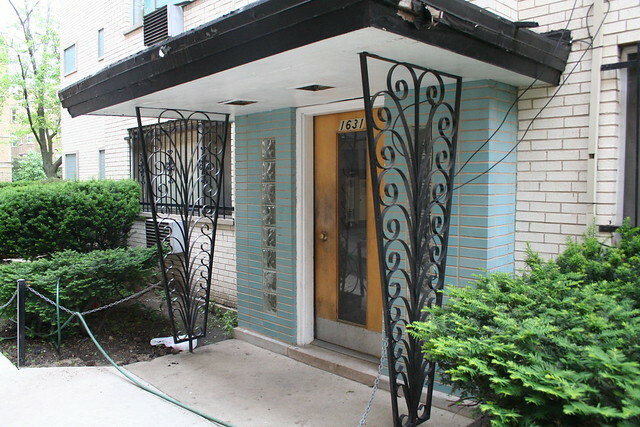 All three came out much the worse – though at least the now-anomalous archway is no longer covered with a giant banner. 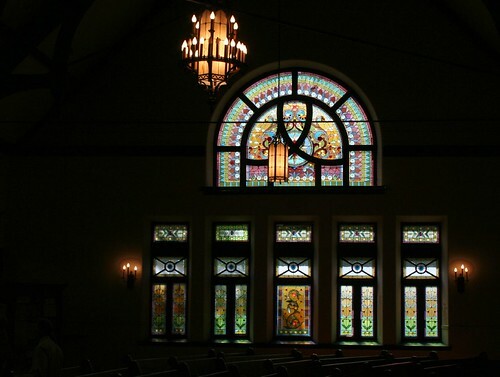 The renovation included installation of bulbs into the long-disused sockets of the arch; the milky stained glass in the arched window appears to be an earlier addition by the short-lived China Spa. 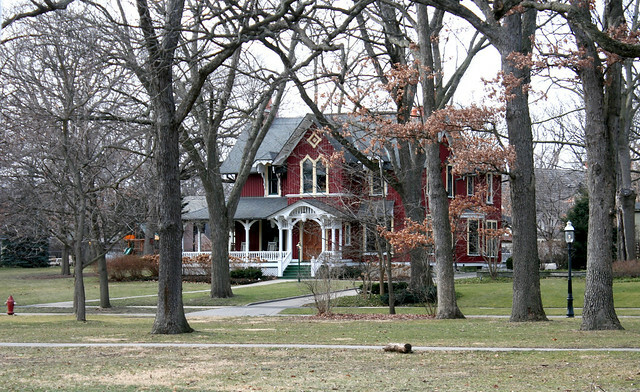 The current tenant, responsible for the red brick ruination, is the Gads Hill Center, a family and community support organization. 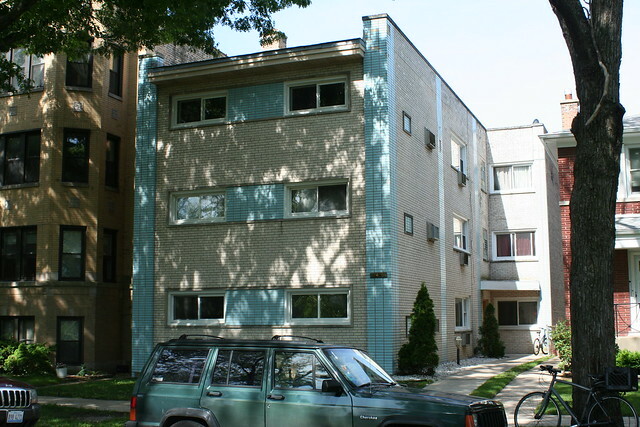 6901 S. Halsted Street – green brick striping punctuated by terra cotta medalions. The building contains apartments above and four retail outlets at the street level. 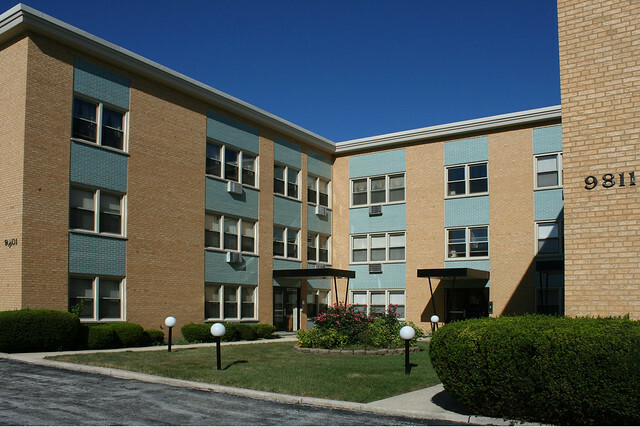 The Family Loan Corporation was a long-time tenant, from the late 1940s through the 1950s. A liquor store came later, in the 1960s. 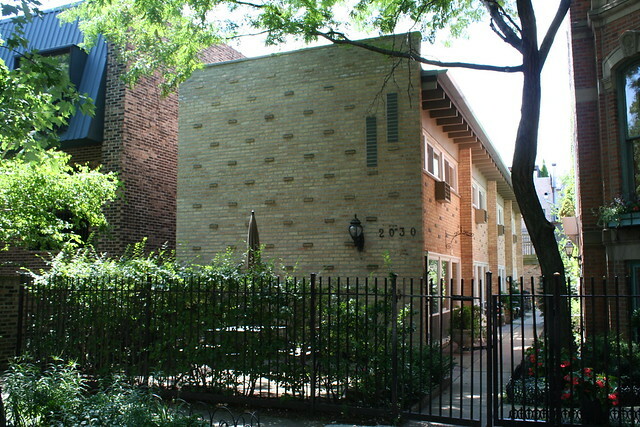 711 W. 47th Street – another curious specimen, a wood framed house tarted up with masonry accents at the street. 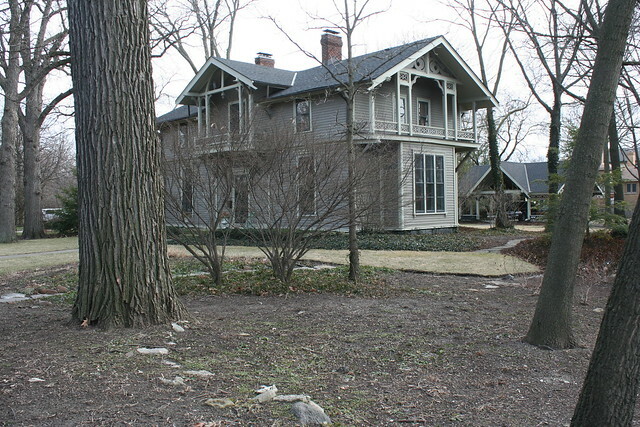 The house is likely much older than the other buildings in this post, which likely date from the 1910s. 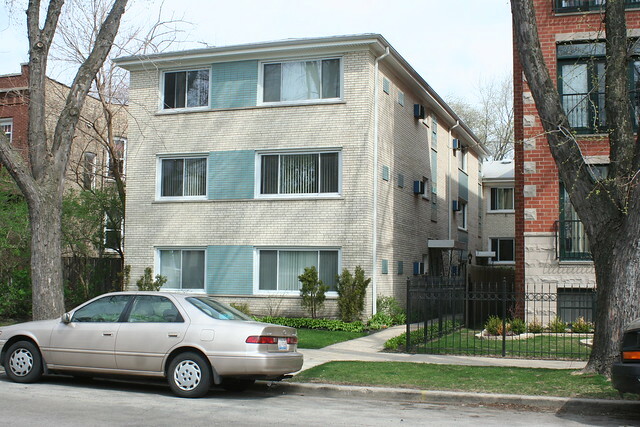 2209 W. Cermak Road, at far right – another apartment-over-storefront configuration. It was a music store in 1919, likely the first tenant. After that the storefront housed a series of doctor’s offices, including one who practiced there for many years before moving out in 1942. The address made headlines in 1977, as another physician operating there was one of several who carried a notable new type of glasses case that the Tribune reviewed. The same doc made headlines again in 1981 under less auspicious circumstances – he and another physician were busted for supplying drugs to street gangs. 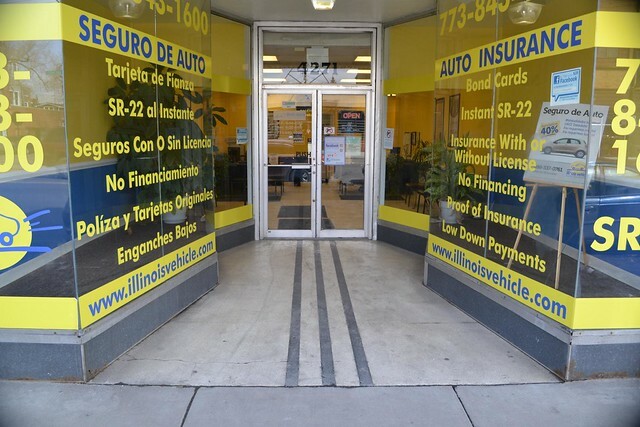 3311 W. Montrose Avenue – Chicago Import, Inc. 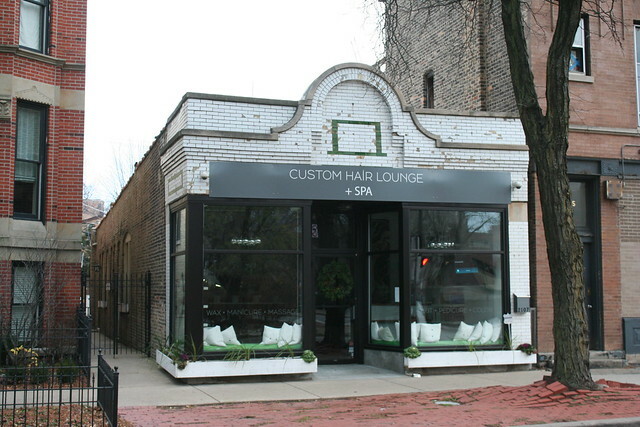 The storefront has been infilled with blonde brick, and the limestone panels in the center appear to be a Mid Century addition. 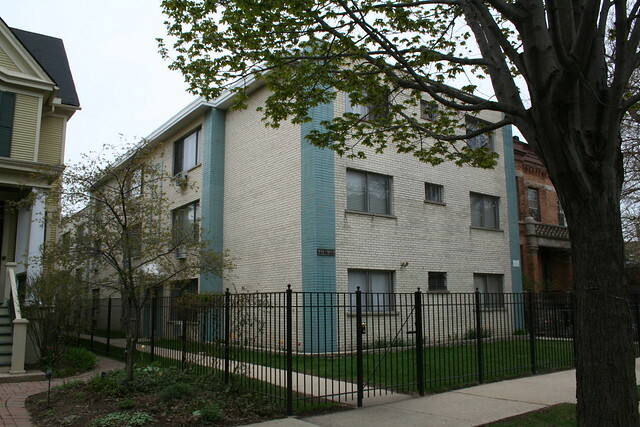 6241 N. Broadway, Uptown – Green Element Resale. 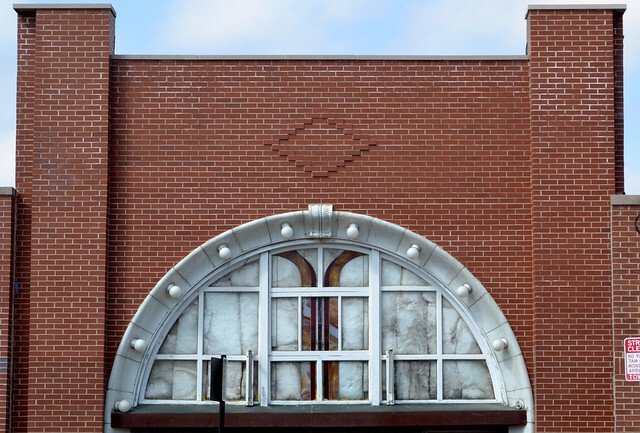 Like the Casino Theater, this building has lost its upper parapet wall – as evidenced by a geometric design that is abruptly sliced off at the roofline. It was the Leon Beloian Rug Company in 1981. 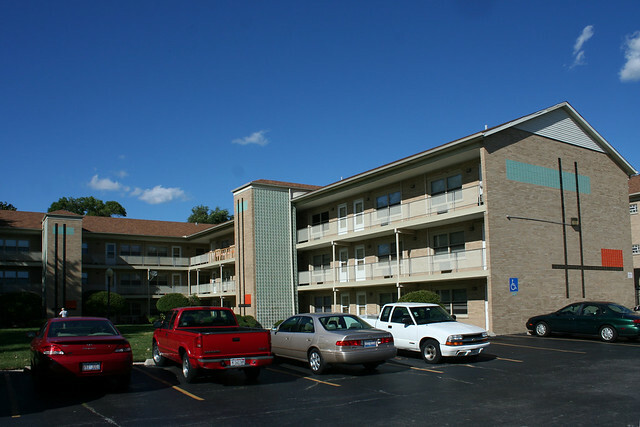 3707 W. 26th Street. Civic Savings and Loan in 1957. Vanek Travel Service in 1960. Mena Mexico Travel Agency today. 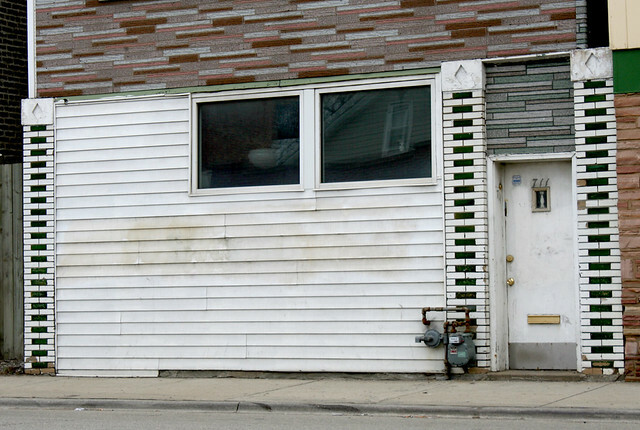 This is actually a storefront addition – there’s a wood frame house behind it, still in use as a residence in 1964 when Mr. Arthur Vanek, owner of the first travel agency, passed away. 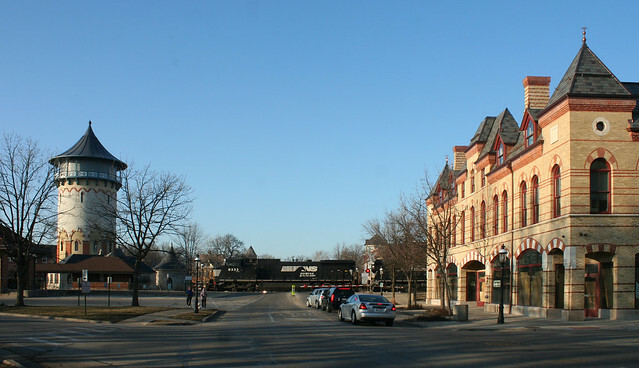 The green was painted over some time between 2007 and 2011. 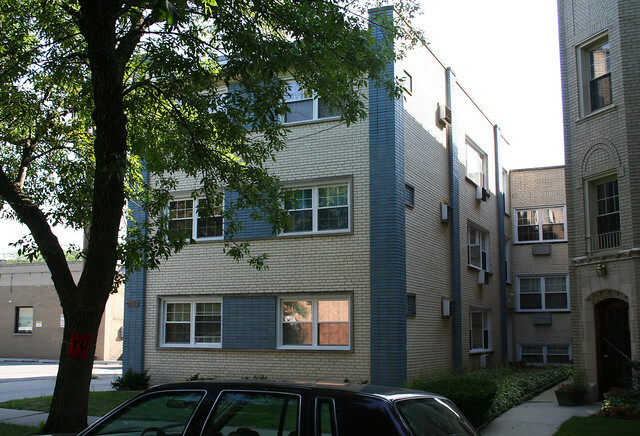 Diversey-Sheffield Building, 946-958 W. Diversey / 2801 N. Sheffield Avenue. 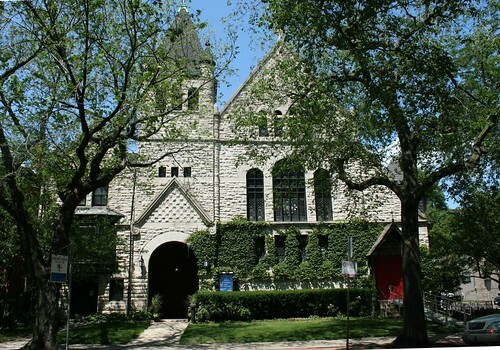 Built in 1916, according to Chicago Architecture Info, this one featured an actual name emblazoned on the corner facade. 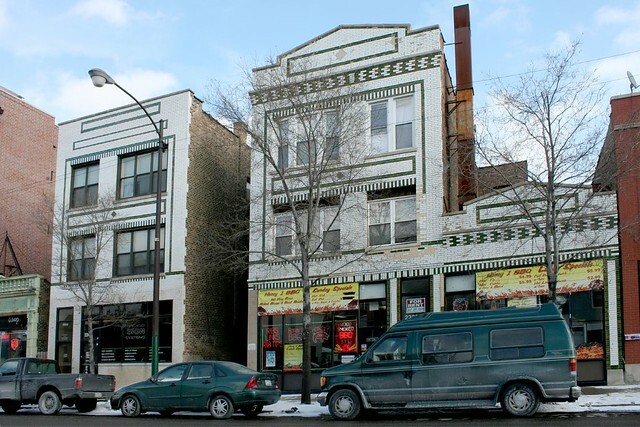 As with the Archer Avenue buildings, that facade was recently lost. 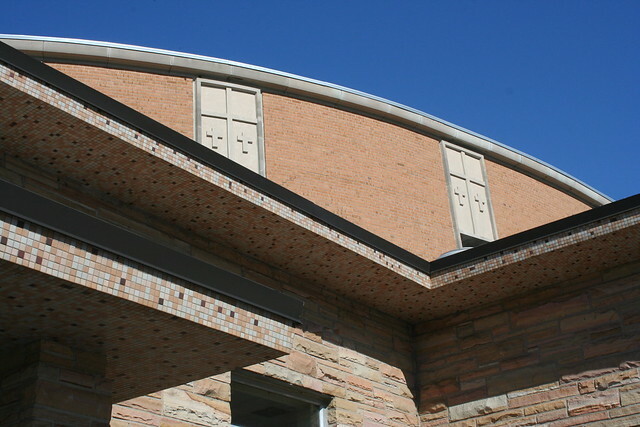 According to the architect’s Facebook page, “the glaze on the brick was failing, the walls were deteriorating and the cornices falling off due to rust.” Modern brown brick replaced the 100 year old white glazed look. 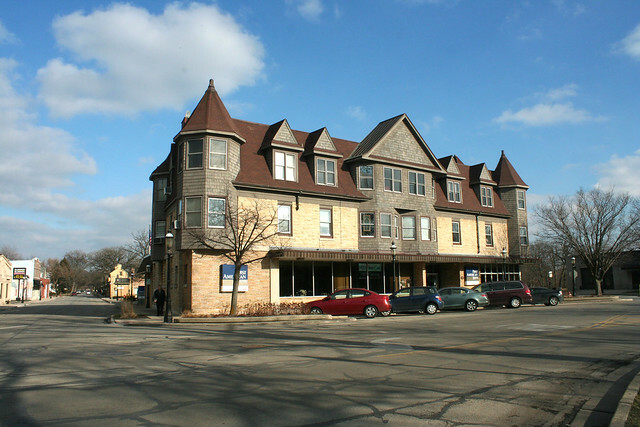 Its multiple storefronts have, and still do, housed a variety of tenants. The fate of the two refaced stores flags up a major issue facing all these buildings – the glazing tends to flake off as the buildings age, particularly if water gets into the walls (due to poor roof or parapet maintenance) and can’t get out (due to a variety of factors.) 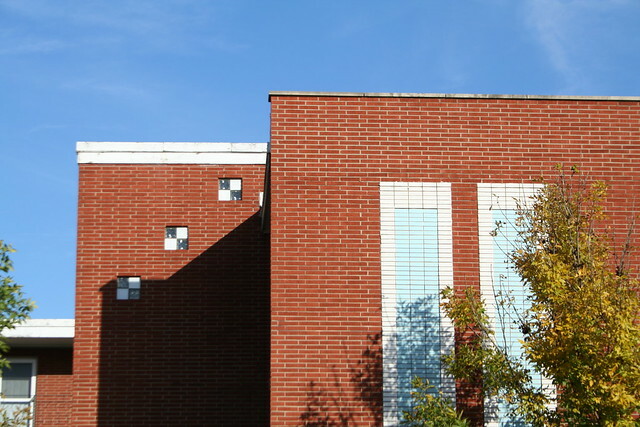 The glazing is the brick’s finished surface, and without that surface the brick decays faster. 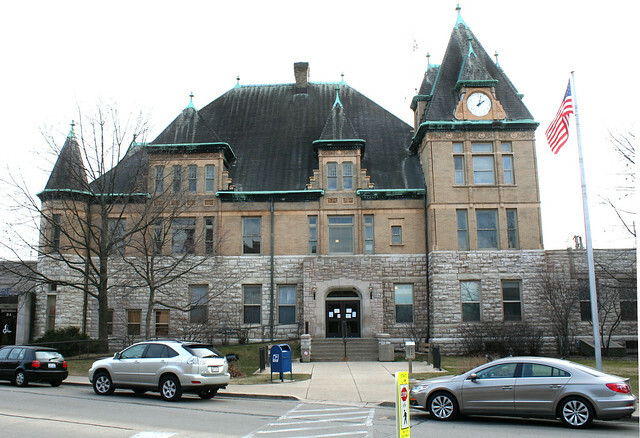 These buildings could become an endangered species if owners continue to defer maintenance. 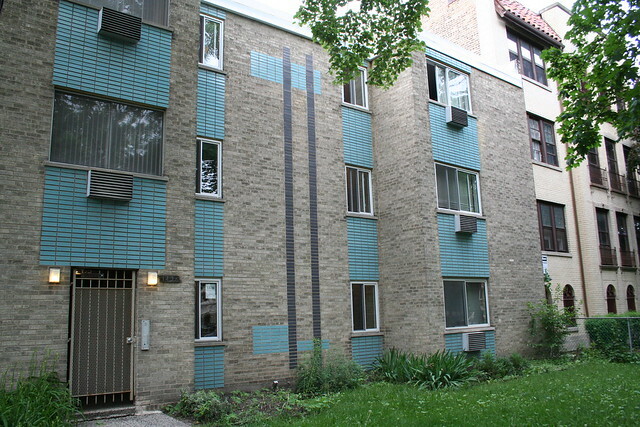 One of my favorite Mid Century Chicago decorative motifs is also among the simplest: patterns of overlapping vertical and horizontal bands, usually done in contrasting colors of brick, on the building’s walls. 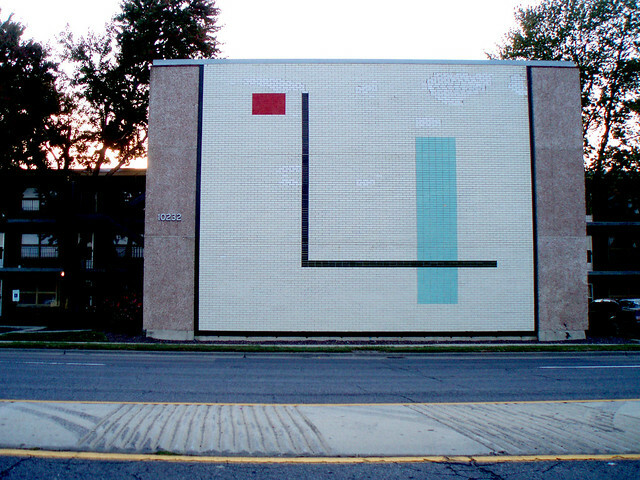 It’s a simple and stylish way to dress up a large wall space with no windows, particularly one on the building’s street frontage. They’re most powerful when used on a completely blank, flat, rectangular wall – a bold mass with a bold pattern inscribed on it. 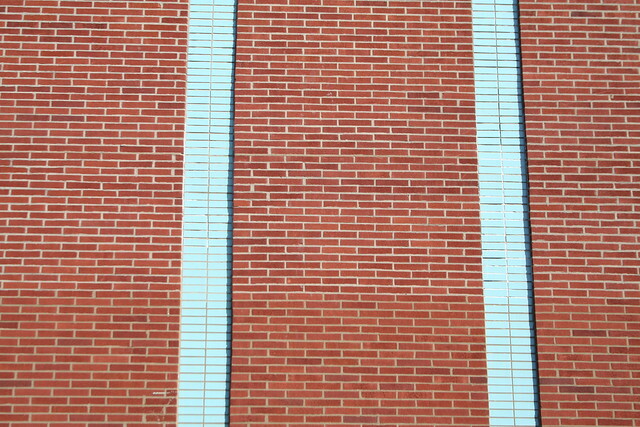 Often the accent brick is a bright color with a glazed finish, contrasting with the matte background brick around it. 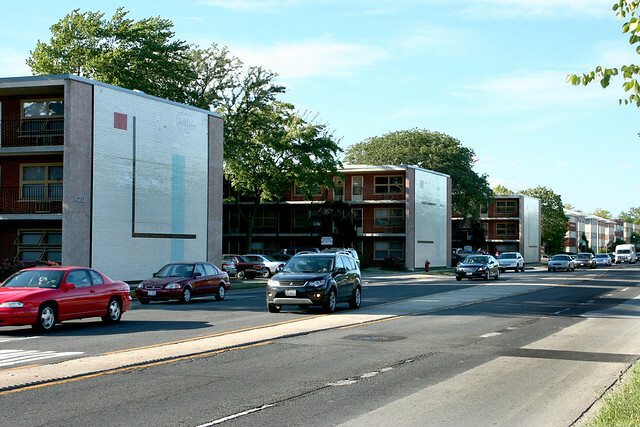 These geometric patterns show up on MCM buildings across Chicagoland, but especially on the south side and inner south suburbs. 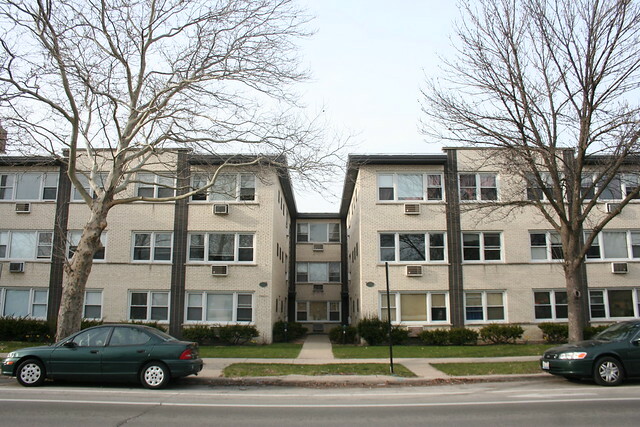 Sadly, I was not able to uncover much about these buildings’ builders or designers, but there are some definite correlations among disparate sites that raise the old question of whether a single designer was repeating their style, or multiple designers were copying one another. 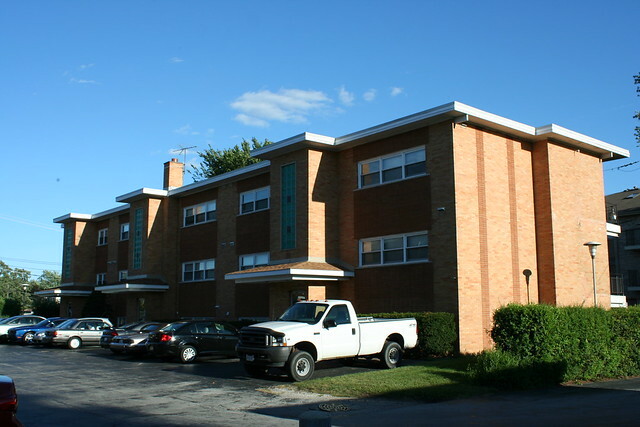 Deanville Condos at 9105-9111 S. Roberts Road, Oak Lawn – a pair of back-to-back walkup buildings with lower-level garages between them. Here, the vertical band is made of lava rock. 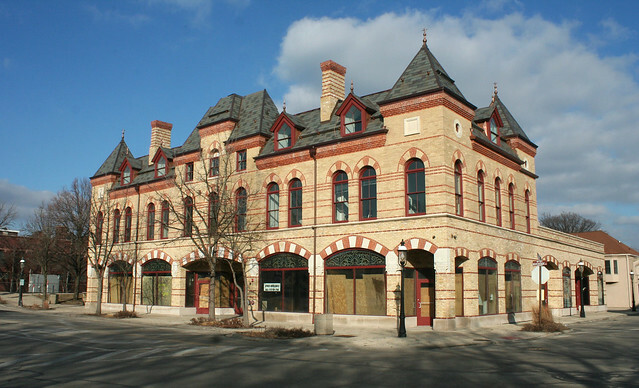 Seemingly of a later vintage than the previous buildings, this pair also makes dramatic use of a quasi-mansard roof over the entryways. 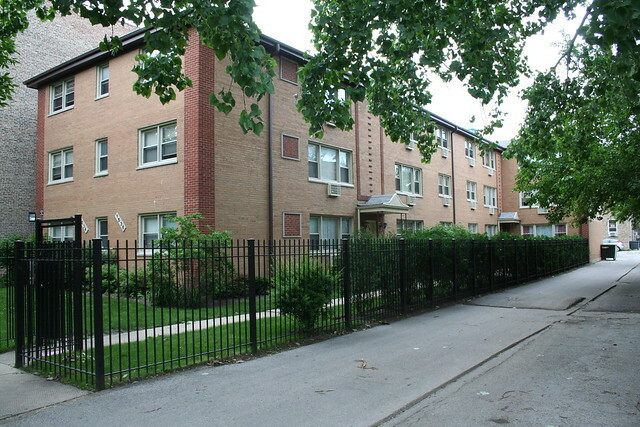 6616 S. Stewart Avenue, Englewood – Chicago. 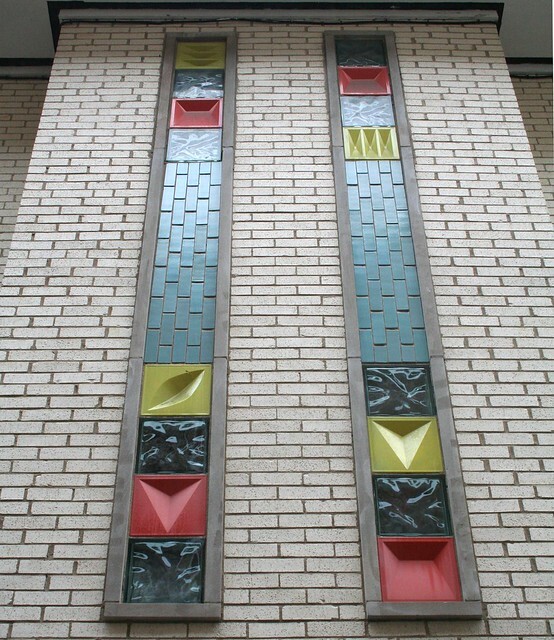 The entryway is marked by a pattern of colored geometric glass block. 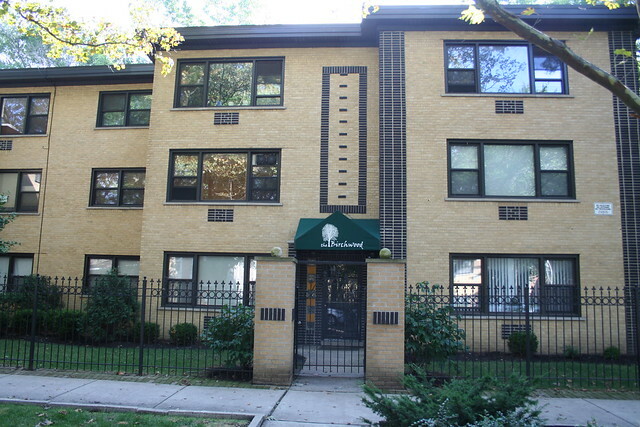 2030 N. Cleveland Avenue, Lincoln Park – Chicago, opened 1963. 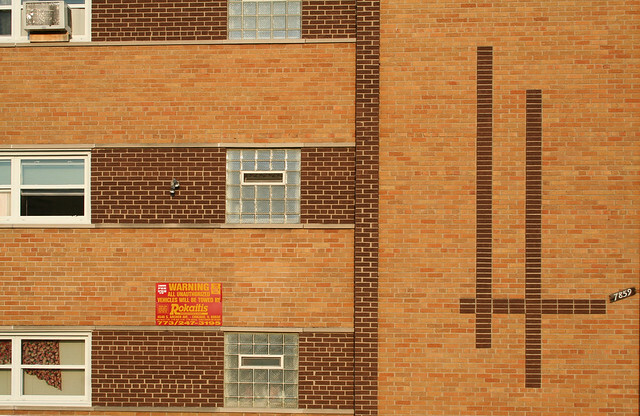 Perhaps the simplest possible iteration of the motif, but accented with a grid of raised bricks. 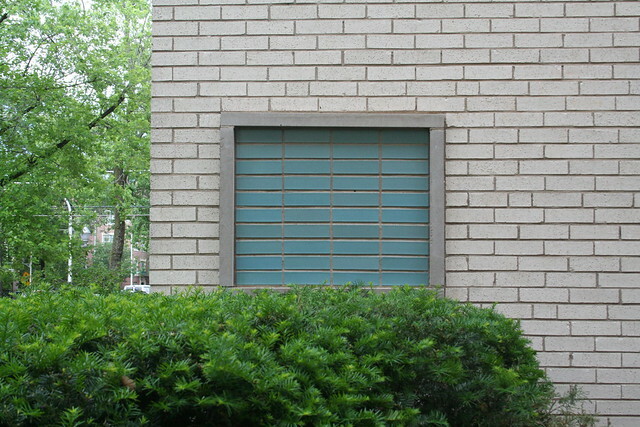 The raised brick grid is itself another common Mid Century architectural motif that appears on many buildings across the region. 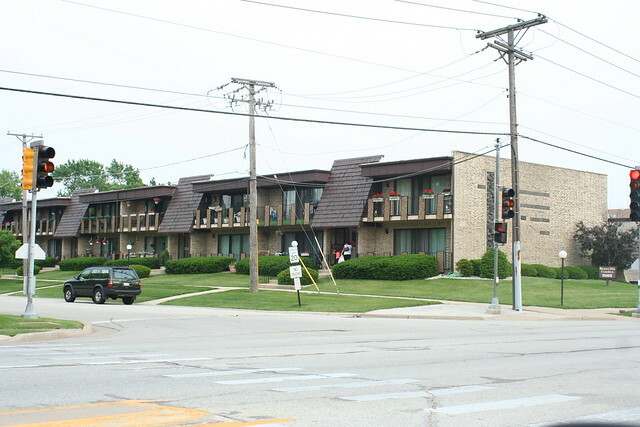 5439 S. 55th Avenue at 25th Street, Cicero – a unique example that uses concrete panels to form its decorative pattern. 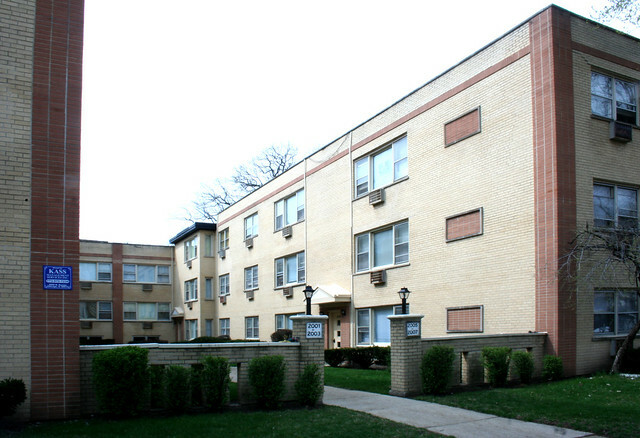 4343 W. 95th Street at Kostner, Oak Lawn, opened 1963. 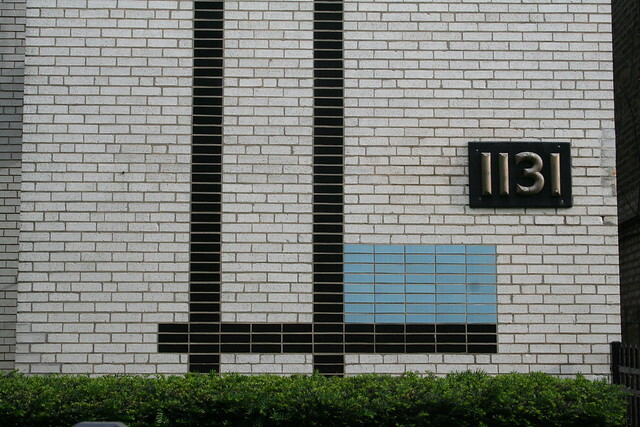 A variation on the theme, with thicker vertical bands and glass block accents. 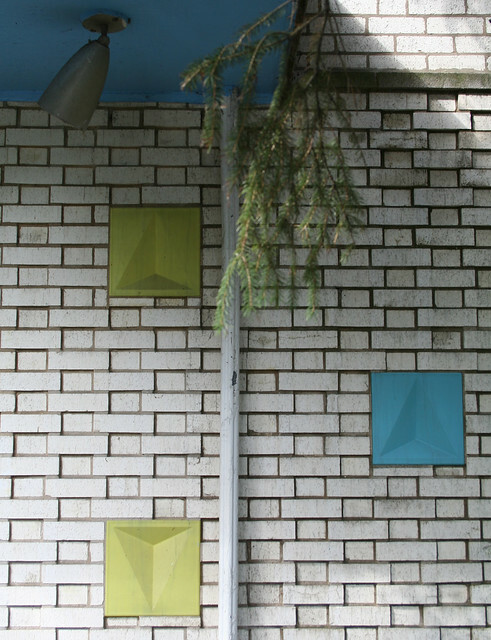 The color pattern is very similar to the alley wall of the Crawford/Pulaski buildings. 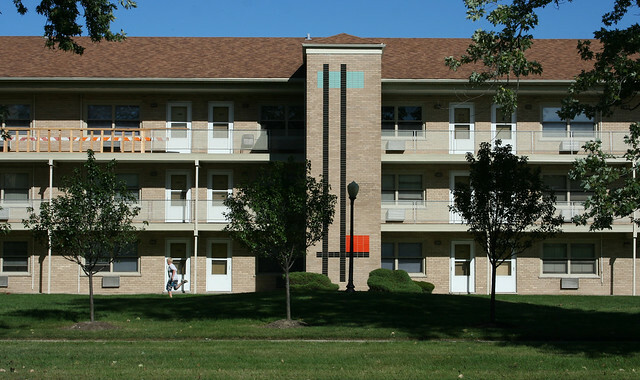 Some designs dispensed with the horizontal accents altogether, instead using a simple column of stacked brick banding. 9600? -9610? 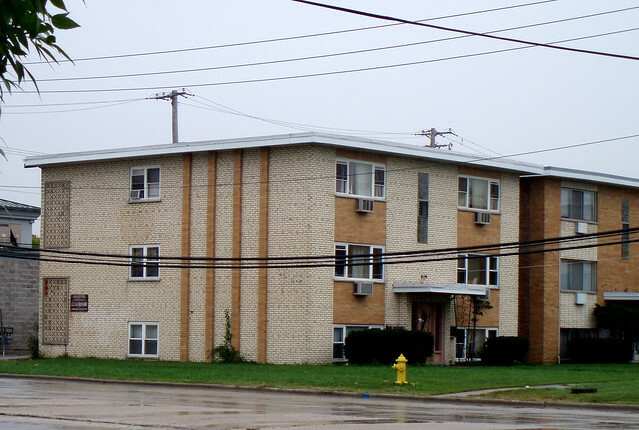 N. Greenwood Avenue, Niles – almost certainly the same builder as the previous example. 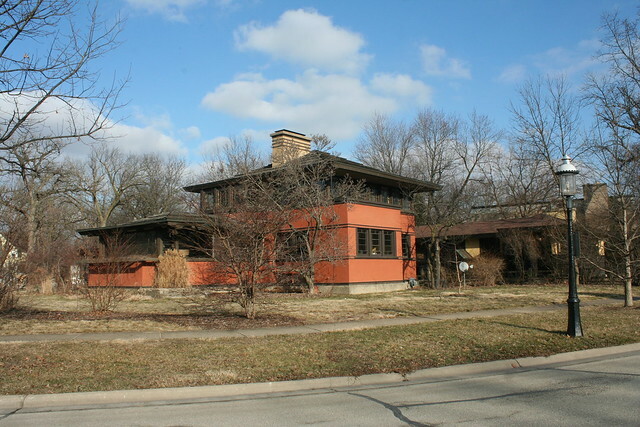 The style is startlingly similar to that used on S. Harlem Avenue by Western Builders. 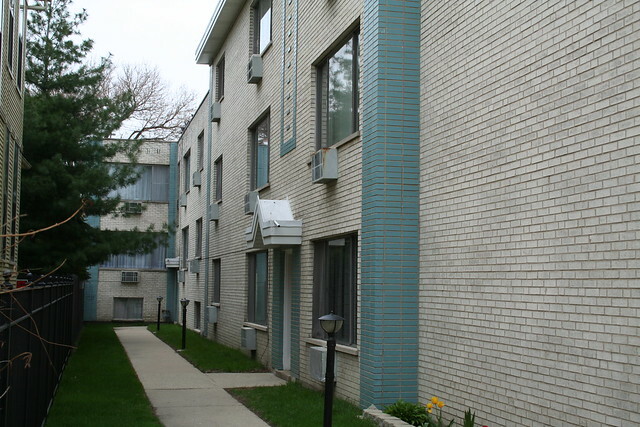 10425 & 10433 S. Longwood Lane, Oak Lawn – again, top to bottom vertical brick bands on a blank sidewall. 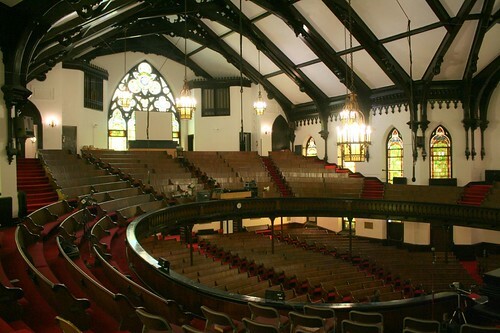 America, in my opinion at least, has had two golden eras of church building. 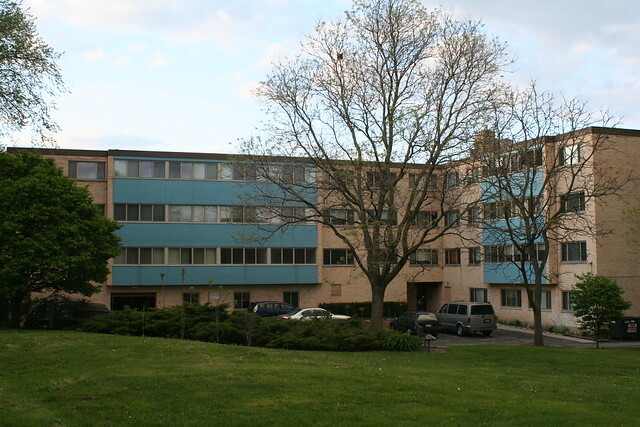 One was the Modernist decades, from the late 1940s into the late 1960s. It was driven by the freedom to design new forms and shapes, to play with light and pure geometrical spaces. 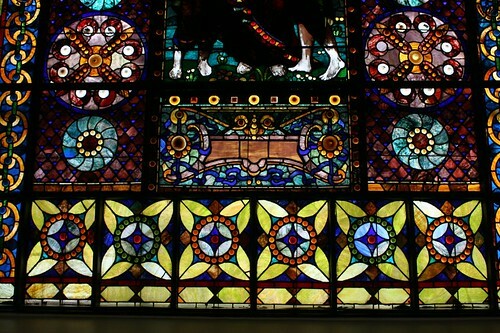 It came accompanied by its own decorative elements and ornamental style, including its own genre of stained glass, but its defining aspect was the uniqueness of each building as an individualistic composition. I’ve written about many examples from this period, and have many more still to share. 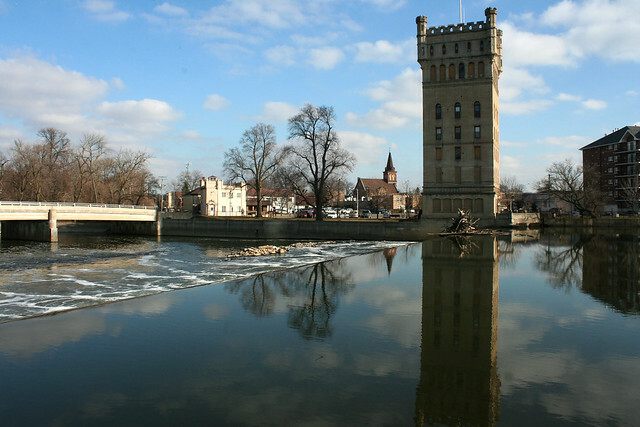 The other began after the Civil War and reached its peak in the 1880s and 1890s. 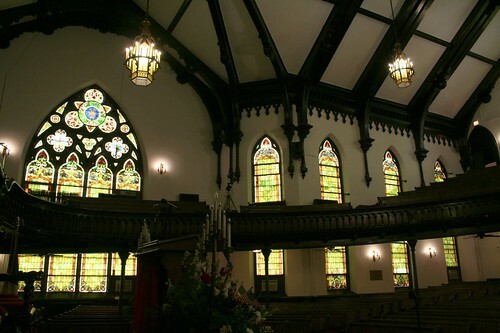 The Gothic style set the tone, supplanting the moribund Greek Classicism that America had long clung to**. 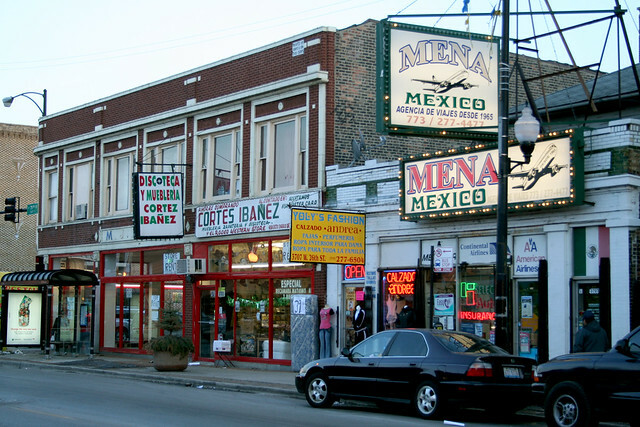 Chicago is rich in surviving examples from this movement. 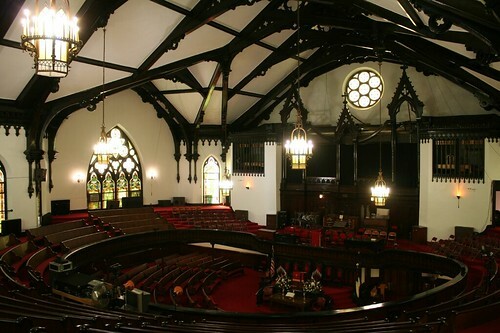 Central-plan churches were the greatest creations of this movement. 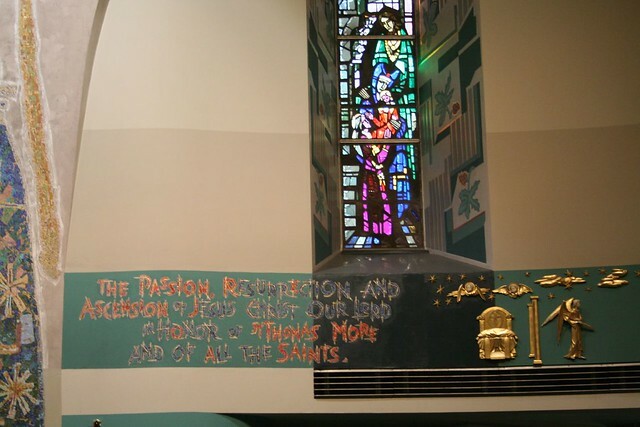 The switch away from a long, linear church to one where the congregation is arranged circularly around the pulpit created a new type of space. New possibilities arose as iron and steel came into play. Heavy wood timbers rose and soared, accented by carvings, iron fastenings, and decorative details. 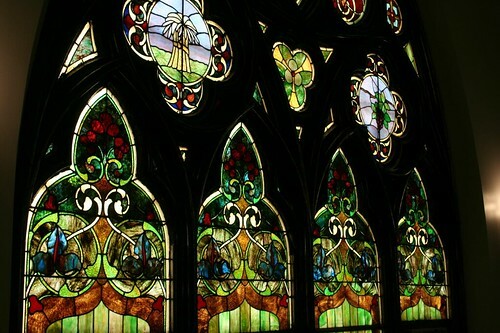 Stained glass in earthy tones of greens and yellows, influenced by the rising Arts and Crafts movement, painted the interiors in subdued, serene light. 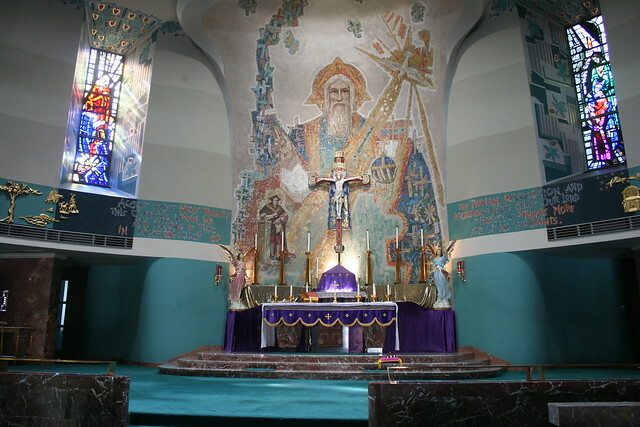 Unlike fussy Classical churches, where every surface was covered in decorative murals or painted patterns, these grand, sublime buildings needed no ornament. The space, and the structural gymnastics at play, are the entire show. And Chicago is as good a place to witness this remarkable era as any. 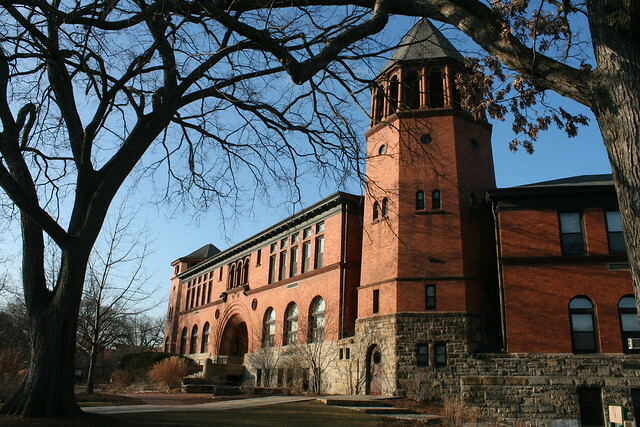 On the outside, straight-up walls, rough-faced masonry, and rounded arch windows characterize this Romanesque style building. 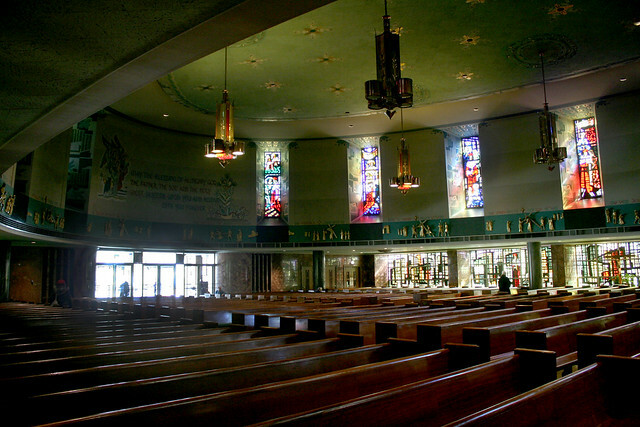 Inside, the sanctuary is a square space laid out with curving pews that bring congregants close to the pulpit. The space is a beautiful study in contrasts – plain white walls with spots of ornamental detailing, against a heavy, massive wood ceiling supported by great wood beams. 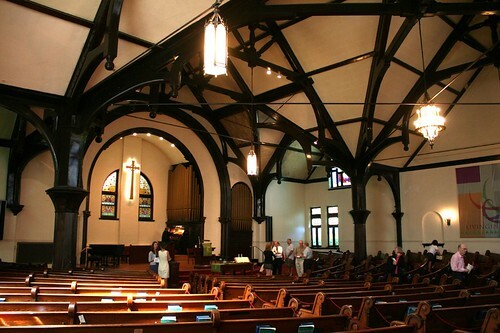 The curving elements are false hammerbeams, possibly non-structural (in a true hammerbeam arrangement, the arch would support a horizontal beam, and a vertical post would spring from the end of the arch, allowing a longer roof beam to be composed of multiple pieces of timber.) Above them are tie beams, upon which rest a hornet’s nest of wood elements. As with the hammerbeams, it’s not clear which if any of the elements are structural and which are purely decorative. The thin size suggests there might be iron tie rods under those round spindles, pulling the two sides of the truss together. 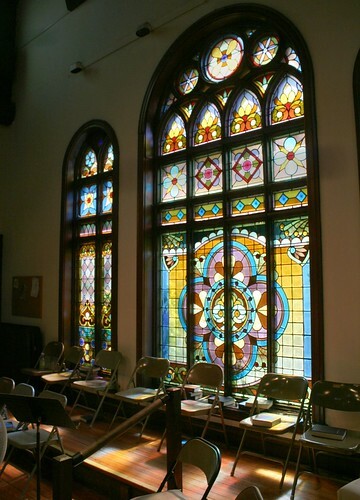 The stained glass was pre-existing, with the new windows designed to accommodate it. 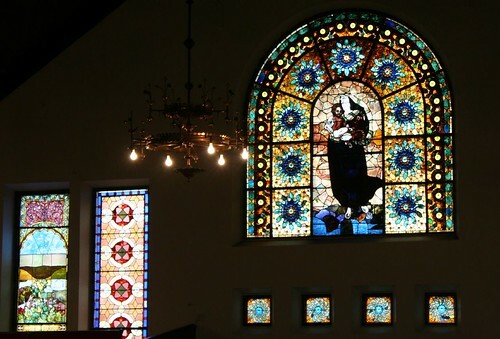 Even from the outside, the stained glass on this Romanesque church is utterly spectacular. Within, it glows, shimmers and twinkles with a thousand rich colors. 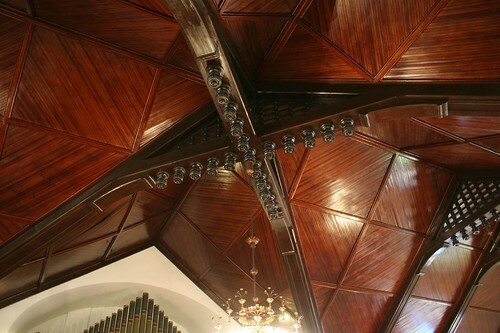 The wood ceiling beams are no less impressive, with A-frame beams meeting and crossing in the center of the space, decorated with inverted finials and a grid of thin timbers above the tie beams. 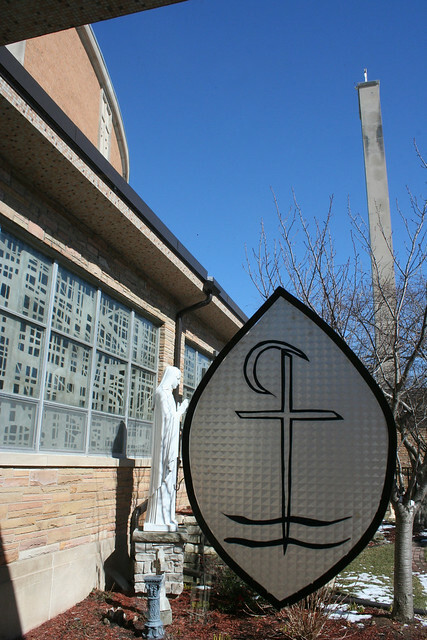 The crossing, where the church’s gable roofs meet, is a simple intersection of these elements. 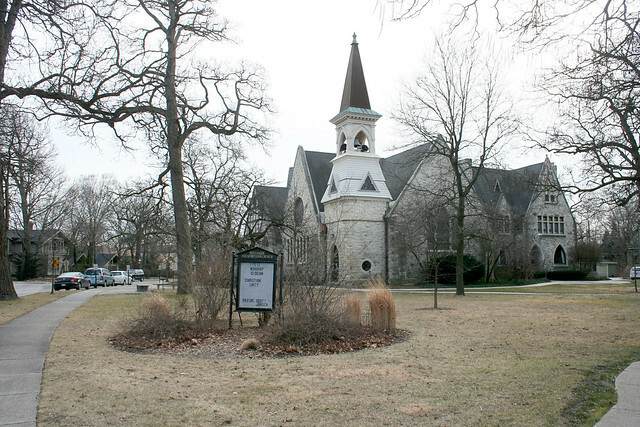 As with Ravenswood Methodist, the squared space and round pews serve to pull the congregation into closer proximity – to the pastor, and to each other. A French Gothic church very nearly in the round, with balconies running nearly all the way around the sanctuary. 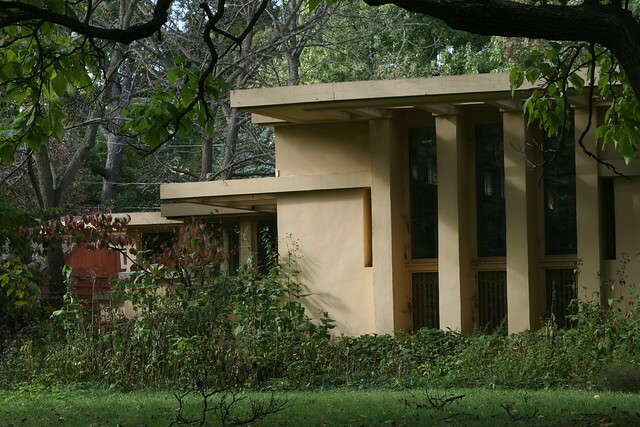 Architect Gurdon Randall is credited as the originator of this style of planning, first built here and widely utilized around the nation in the following two decades. The white painted plaster ceiling shows off the dark wood ceiling beams well. 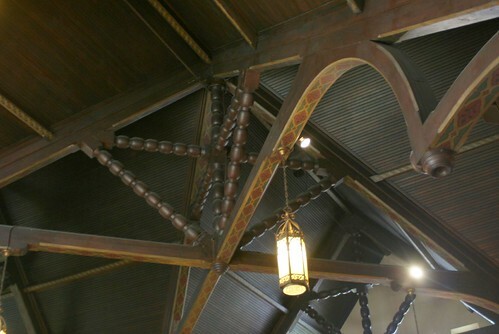 The wood beams are heavily ornamented, but their structural role seems very simple – nearly plain beams with a small scissor truss element at the top, nearly buried in non-structural ornament. 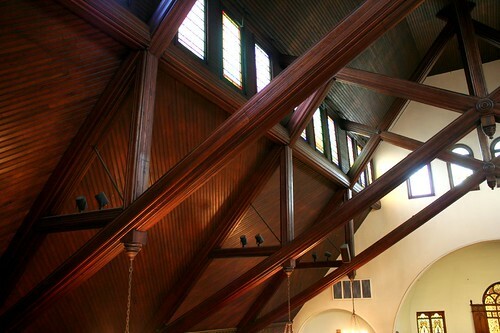 Small wood arches create a place for the trusses to land on the walls, visually if not structurally. 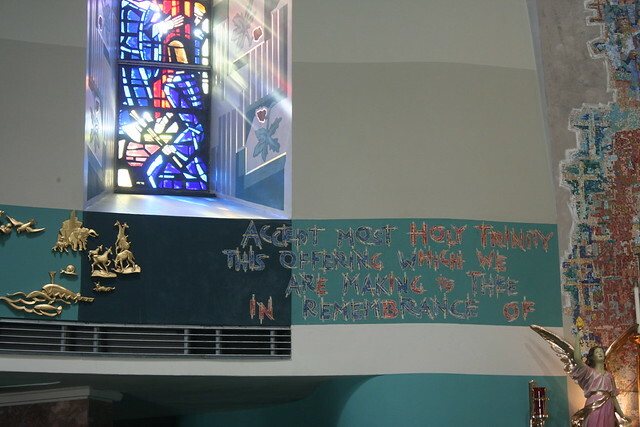 Comparing the inside ceiling slope to the exterior roof pitch reveals that this is a false ceiling with considerable enclosed space above it; the church’s site confirms there is a 20 foot high attic space above. 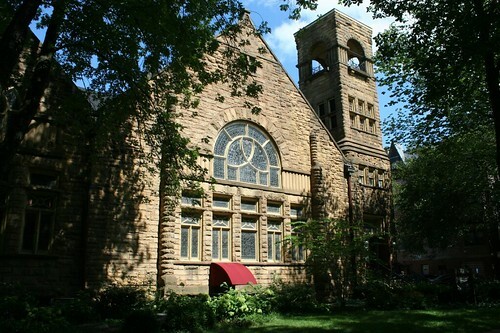 Designed by the same architect as Ravenswood Methodist, in the Richardsonian Romanesque style on the outside. 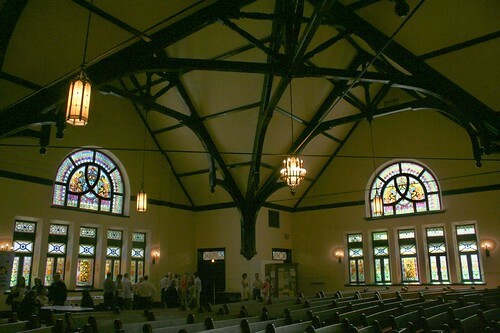 Inside, the ceiling structure includes a tangle of false hammerbeams near the base of the roof beams, with kingpost trusses near the roof peak. The kingpost is the vertical beam at the center of the truss – it hangs from the peak, and helps support the cross-beam member below it. The cross-beam is tied in to the ends of the roof beams, and pulls them together so they don’t push the walls outward. 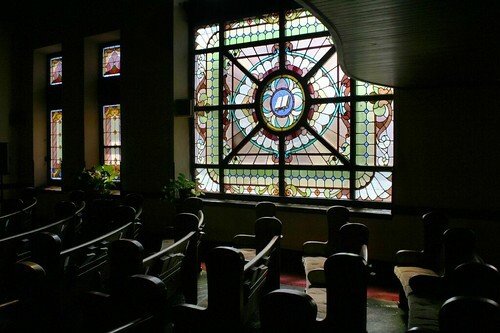 The stained glass, meanwhile, has much in common with other churches of the era. 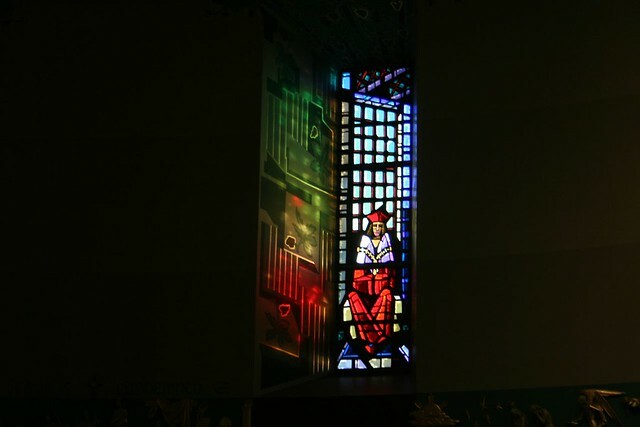 Patterns of color are used as much as images, reinforced by jeweled glass ornaments that throw slivers of sunlight into the space. 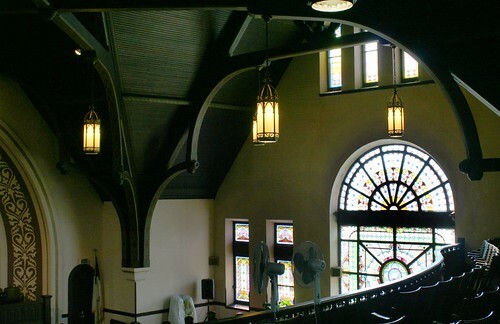 The 4-panel scissor truss structure here might appear simple at a glance due to the straight members, but it’s probably the most complex beam system of all these churches. 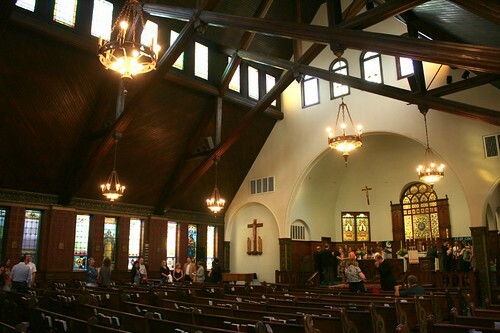 A series of horizontal and vertical web members complicate the wood connections, while the lower beams actually pass through the upper beams, projecting a bit beyond them to support the roof over a row of clerestory windows. 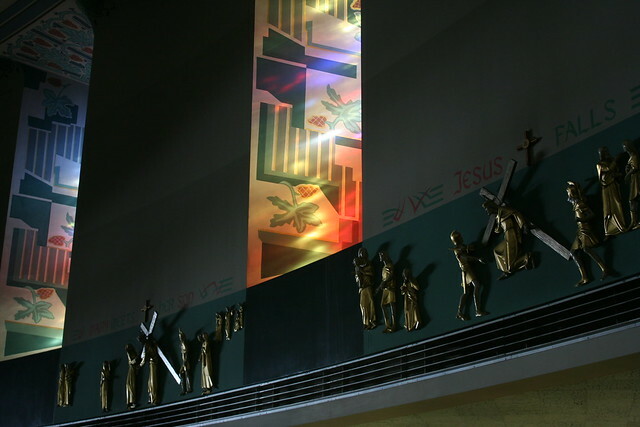 The finest space in the church is the least accessed – the balcony, occupied only by the organist and choir, is flooded with colored light on sunny days. 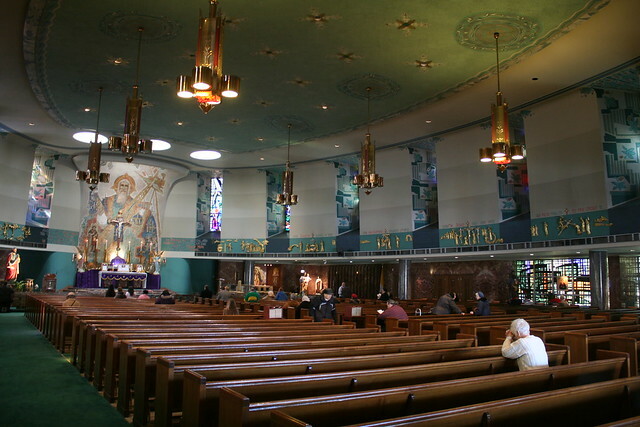 It also makes it the warmest space in the church – several fans were going when I visited. But the light was breathtaking. 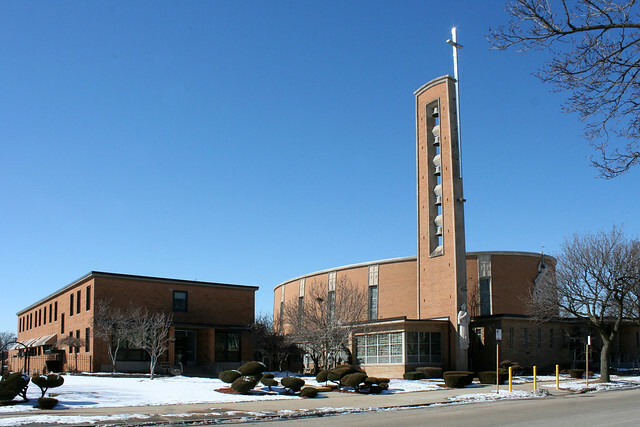 For more churches of this era, see: Suburban in Their Day. The structural picture painted by these visible wood beams isn’t the whole story. 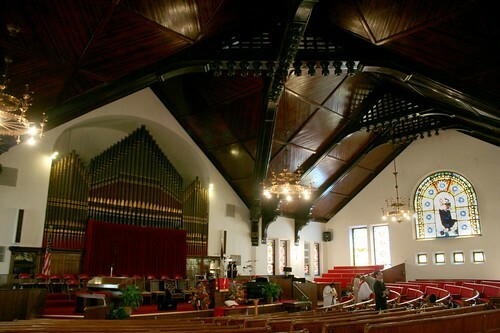 First Congregational Baptist, for example, has considerable augmentation to its structure above the false ceiling. 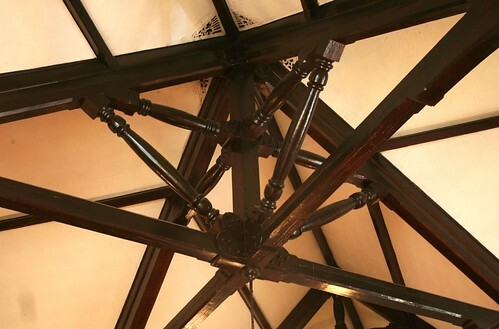 Iron tie-rods were commonly used during this era as an affordable way to keep trusses from pushing horizontally on the walls, allowing the walls of neo-Gothic churches to be built without the massive and complex stone buttresses that vintage Gothic churches required; however, not a trace of iron is visible in these sanctuaries – suggesting it was hidden beneath wood veneer or between joined beams. Nevertheless, these fantastic flying beams still say a lot about the tremendous weights and forces at work in the roof of any great space – a story too often hidden in Classical style churches. 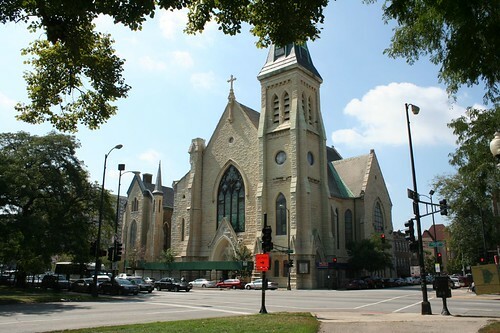 ** I don’t HATE Classical (eg Greek Revival) style, but I definitely find it boring, stodgy, pompous, stifling and unoriginal when compared to the freeing expressiveness of Neo Gothic and the various Romanticist styles that flowed out of it, including the Romanesque. 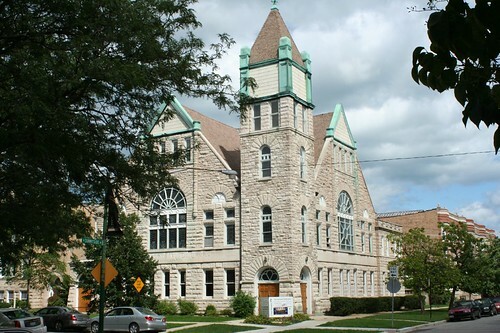 The overwhelming popularity of Classicism remains a continual source of bafflement to me; I tend to feel that once you’ve seen one faux Greek temple bank/church/funeral home/whatever, you’ve seen ’em all – while the Gothic church unfolds in endless variety. 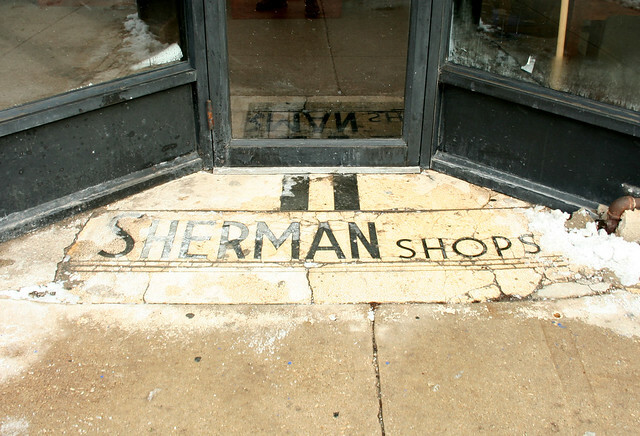 Sherman Shops – 3113 Lincoln Avenue. 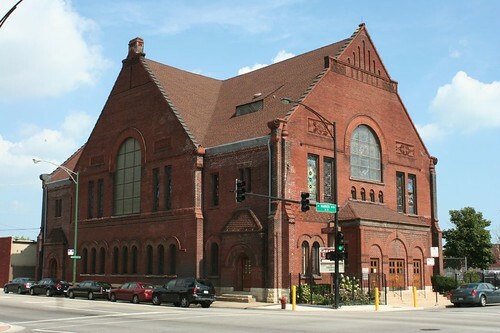 Now the Kabbalah Centre, this was originally an part of a clothing store chain with dozens of stores across the Midwestern and Southern states, including more than 20 in Chicagoland. This one was open by 1940. 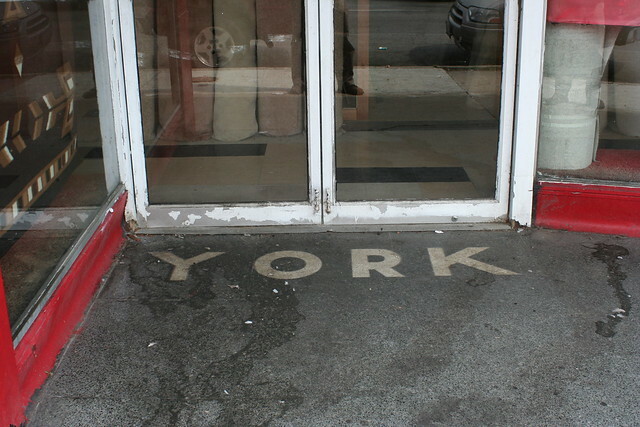 Look down in the right parts of town, and you’ll see them – stylized, stylish lettering in the pavement outside of a store, usually proclaiming the name of some long-gone business – maybe a well-known regional chain, maybe a one-off store that has drifted into obscurity. 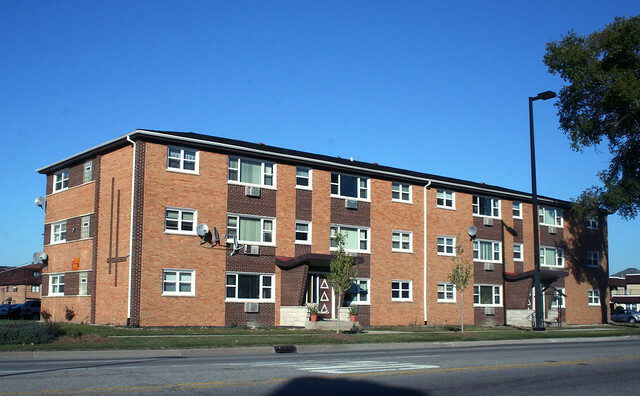 2514 W. Devon Avenue. In 1938 this was home to Robertson & Co., “The House of Liquid Tiling”, “the modern finish” for woodwork and walls; they left some time after 1944. 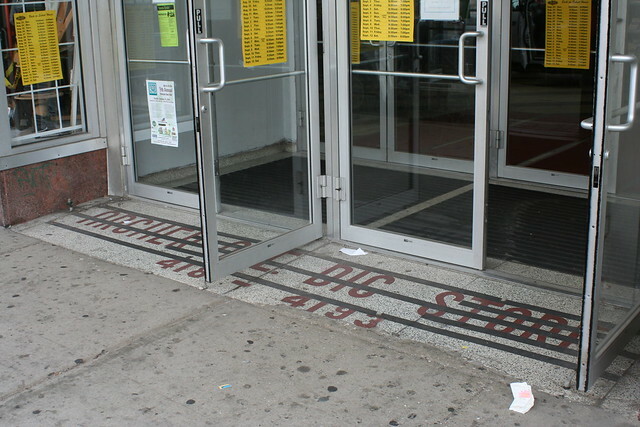 By 1949, Gollay’s, Inc. had moved in, imprinting their name on the entryway. Gollay’s was an interior decorator and furniture store for “lamps, gifts and occasional furniture”. The founder, Charles Gollay, passed away in 1955; the store continued as Gollay’s Gifts. Gollay’s Lamp and Gift Shop ran a Going Out of Business sale ad in early 1962, and by 1964 they had been replaced by J.C. Cooper, a men’s clothier (later David Cooper, Inc.) which lasted into the late 1970s. 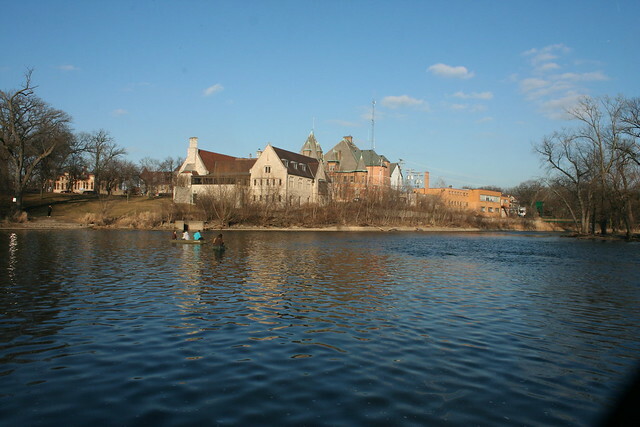 Most recently it was home to Bombay Electronics, which has since gone out of business. 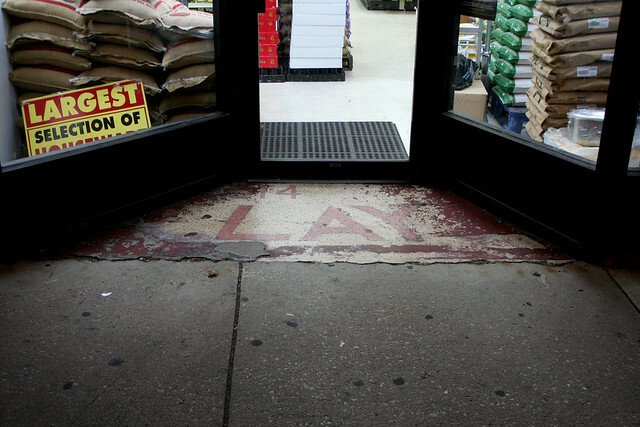 Today the entry is partially covered by an alteration to the storefront as well as a thin concrete coating that has mostly been removed (or worn away). The legible portion of the name reads “LLAY’S” and gives the street address. 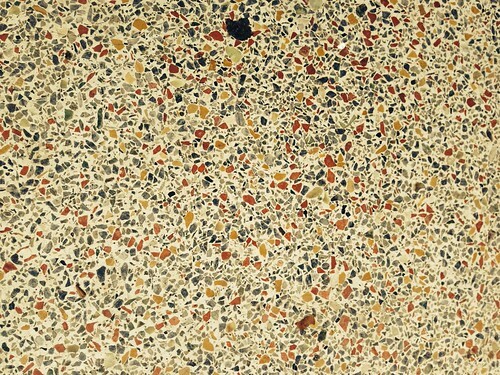 Terrazzo is a pourable substance with fragments of a material – marble, stone, etc. – embedded in a cement-like adhesive, then ground smooth after it has set. Thin metal strips are used to create patterns by separating different colors or materials. 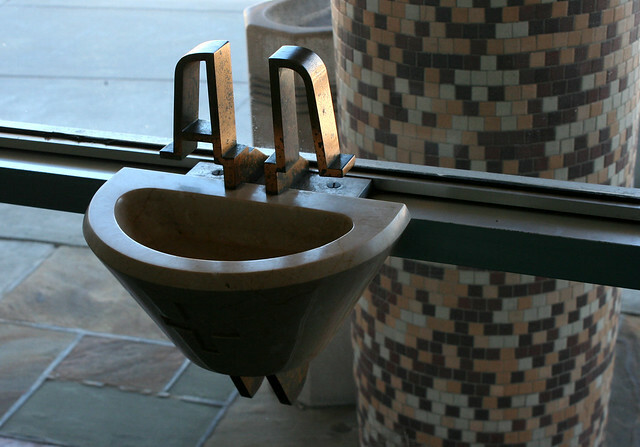 The material enjoyed widespread popularity at midcentury, peaking in the 1940s when it appeared in numerous storefront entryways. 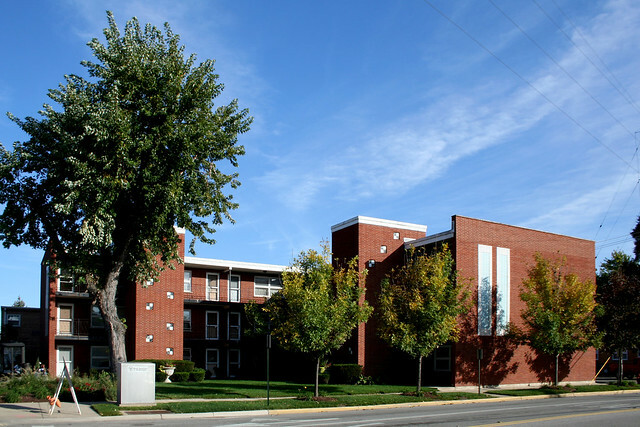 They were added to many styles of buildings – both older buildings with post-War remodelings at street level, and on newer, smaller commercial buildings, almost always in conjunction with a modern style of storefront. They aren’t always fancy; they may be as simple as a solid color with no design at all. 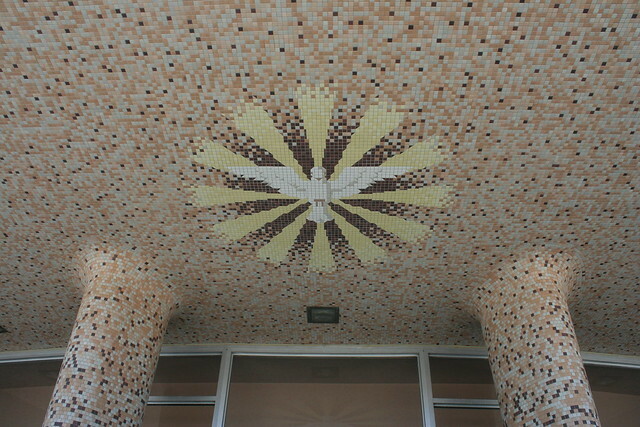 A typical terrazzo entryway on Devon Avenue. Photo courtesy of Joan Sillins. 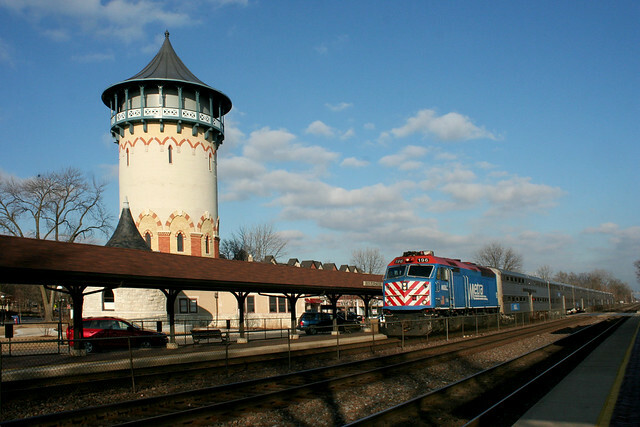 Chicago had dozens, if not hundreds, of examples, many of which survive today. They can be tough to spot, though – you won’t see them if you’re driving or even biking; you have to be on foot. They are very frequently hidden by door mats, sometimes obscured by display racks or shelves, and occasionally covered up entirely by later remodelings. But their durable nature means they are rarely removed – in fact, in almost every case, they far outlast the businesses that they advertise. 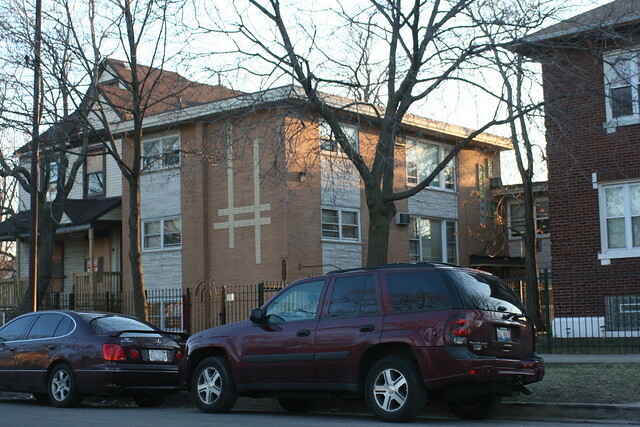 3433 W. Fullerton Avenue – an anchor inscribed on a stylized letter “B”. Home to a tavern in 1955 (license revoked in 1961 because it was reportedly “a hangout for sexual deviants”, 1960s-speak for a gay-friendly bar.) 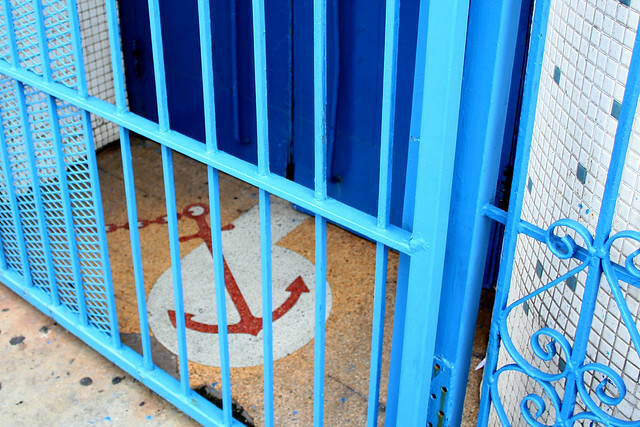 Now the Acapulco Night Club, opened in 1987. 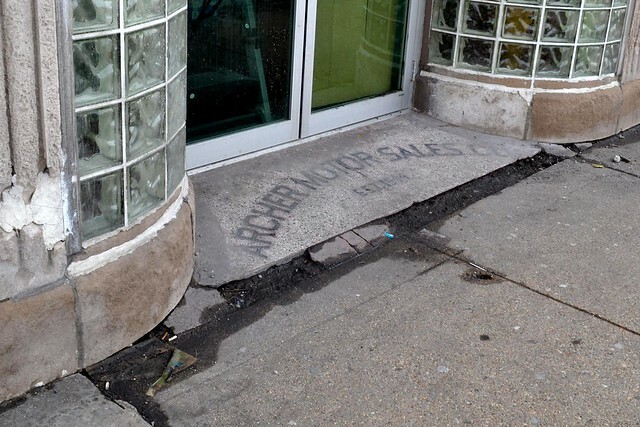 Milwaukee Avenue is one of the city’s most architecturally rich streets, and one of the best for finding terrazzo entryways. 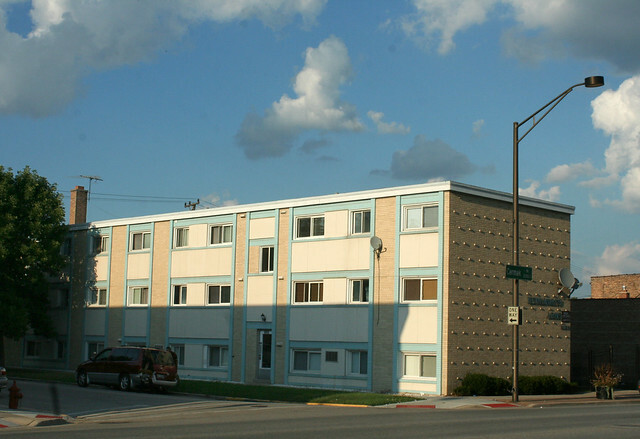 Along its considerable length may be found many markers of successful commercial strips – jazzy storefronts, elaborate neon signs, and many stylish terrazzo floors. 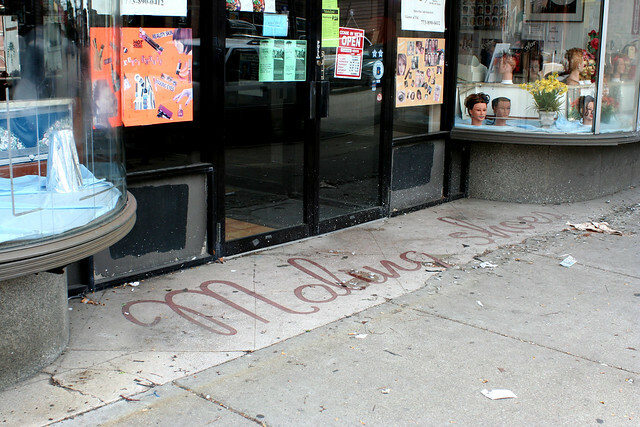 Feltman & Curme shoe store – 4049 N. Milwaukee, Portage Park neighborhood. In 1926, this had been Frost’s Men’s Shop; by 1929, it was a Loblaw Groceteria, a grocery chain with many outlets across the city; by 1934, a Jewel food store, which lasted until 1940. 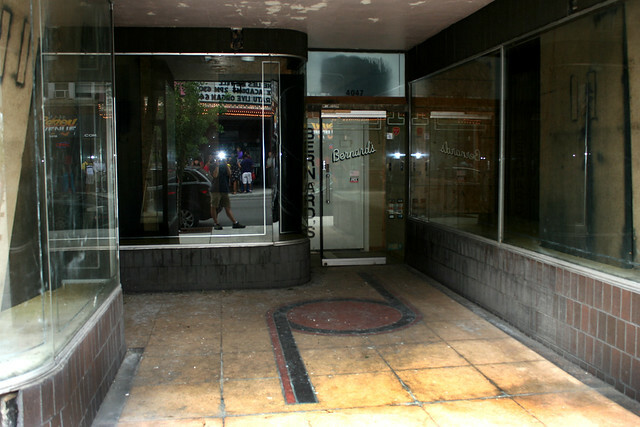 The spectacular storefront was installed when Feltman & Curme moved in circa 1941, and is similar to an outlet on State Street which got a full-page grand opening ad in 1942. 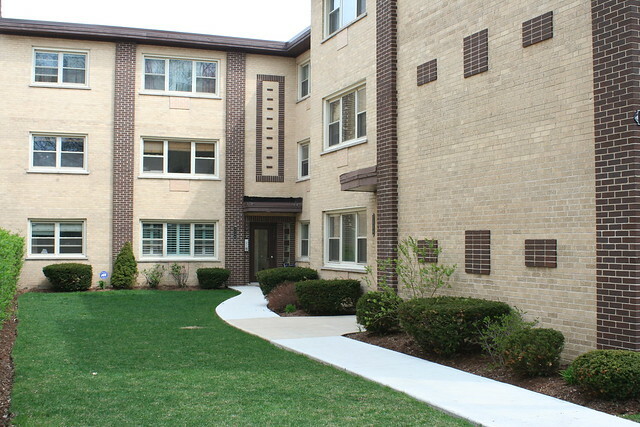 This entry and the one next door (below) harmonize but are not the same design at all. 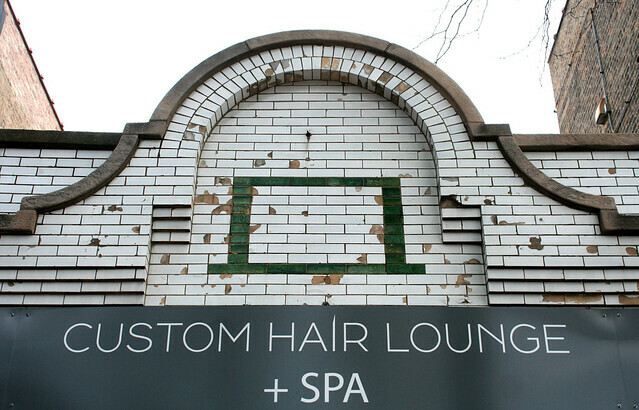 Both speak of the streamlined elegance common in commercial settings before World War II. Feltman lasted through 1955, and the real long-term beneficiary of their superb taste was Siegel’s Shoe Store, who had taken their place by 1958 and lasted well into the 1980s. 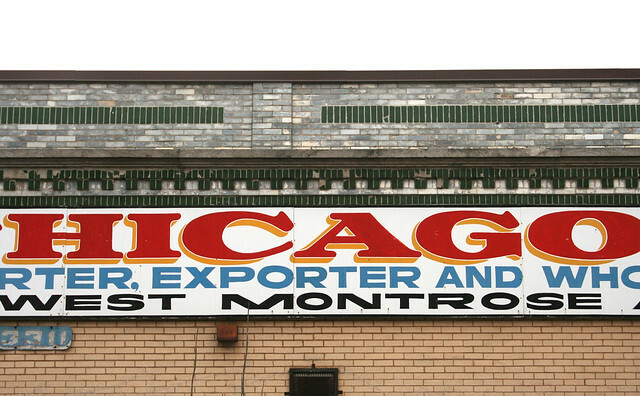 Brandt’s Shoes – 4047 N. Milwaukee Avenue, Portage Park neighborhood. In 1926 this was a Wurlitzer musical instrument store; by 1928, a Lyon and Healy radio store, which seems to have closed in 1932. In 1938, the social pages mention a “Goldammer’s Garden recreation” here, in connection with a bowling tournament. 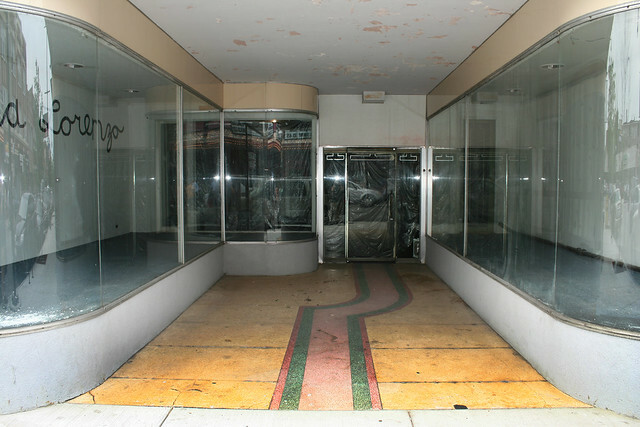 By 1940, Brandt’s Shoes had opened here, the most likely candidate for having installed the stylish terrazzo floor and display cases; they were replaced in 1947 by Kinney’s shoe store and most recently by Bernard’s Electronic Outlet. This particular motif – a circle with offshooting lines, which can represent several letters including B, D, J or P – was common enough that I recently saw the same design on a floor in Washington DC. 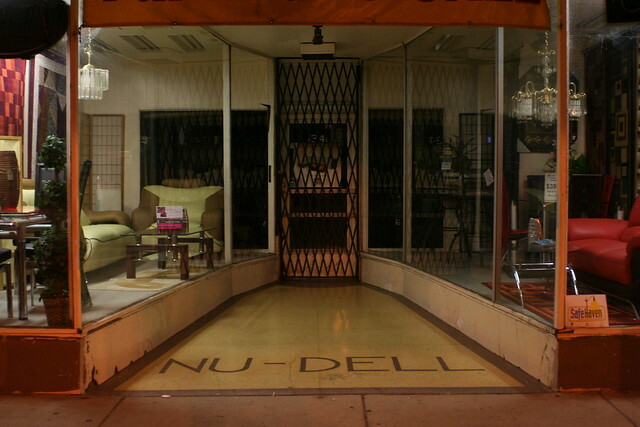 Nu-Dell Apparel Shops – 1341 N. Milwaukee – a local clothing store chain, in business here by 1940, replacing the W.L. Douglas Shoe Company which had operated here previously since the 1920s. Now Milwaukee Furniture. A razor-thin sans-serif font gives the air of 1940s moderne, as does the off-yellow color. 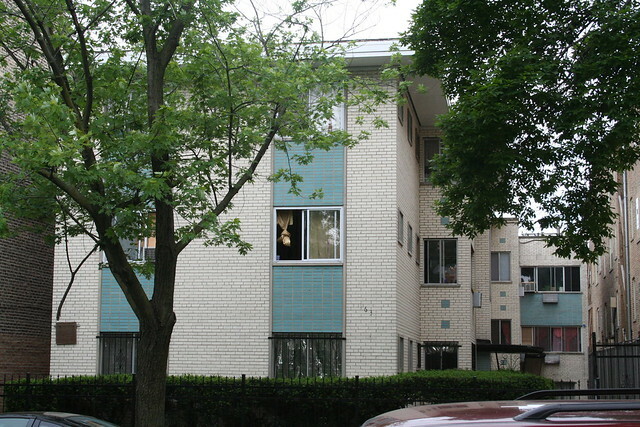 Another Nu-Dell terrazzo floor exists on Archer Avenue. 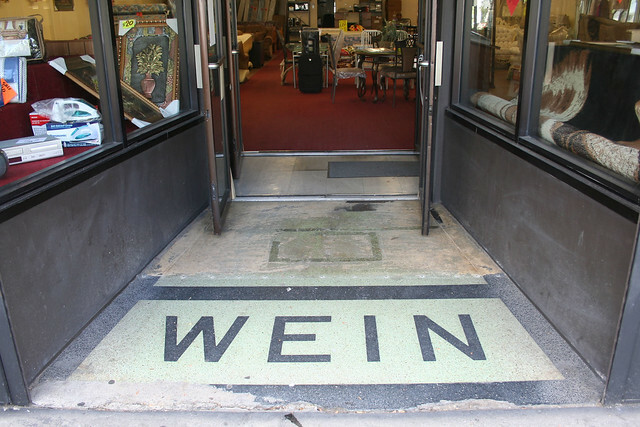 Wein’s Department Store – 2994 N. Milwaukee, open in 1959 but surprisingly absent from the Chicago-Tribune. Later Buen Hogar Furniture, now closed. 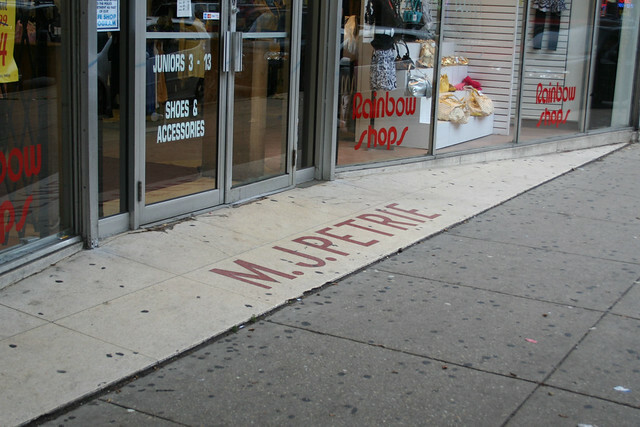 M.J. Petrie – 2768 Milwaukee Avenue – part of the Petrie Stores chain of women’s clothing shops; later Rainbow Shops – now Shoe Source Shoes and Clothing. A scan of the classified ads pegs this location to a 1946 opening. The simple style and the use of initials hearken back to the conventions used on modest commercial buildings of the 1880s and 1890s. 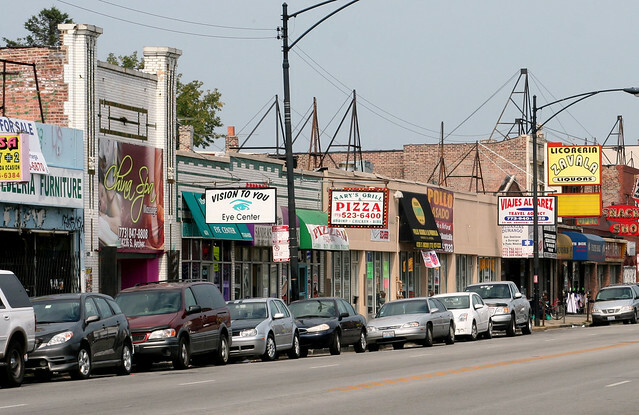 Though it’s not as rich a source of terrazzo floors as Milwaukee Avenue, there are still a few to be found in the vibrant Little Village corridor along 26th Street. 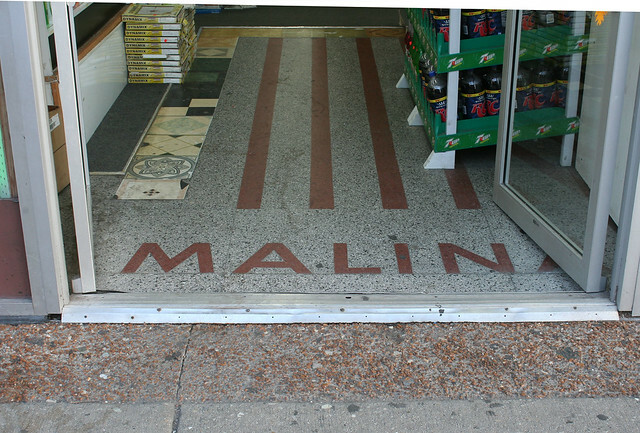 Malina apparel, 3625 W. 26th Street – first appears by 1951; lasted until 1971. Now Happy Dollar Plus. The stripes give it a bit of Streamline flare, an effect diminished by the revised storefront which covers part of the design. 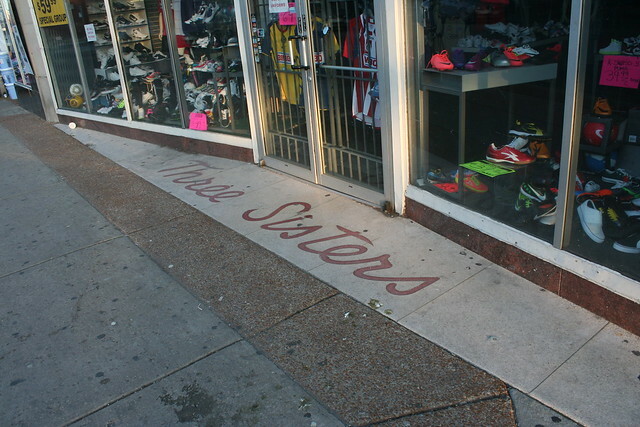 Three Sisters, 3407 W. 26th Street – originally a clothing chain, opened here in 1948 and still in business in 1960; now Game Time Soccer Store. 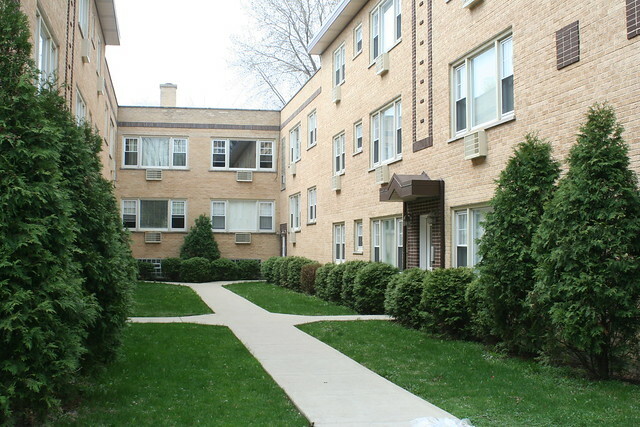 A third hot spot for terrazzo entries is Archer Avenue, a lengthy boulevard running diagonally southwest, from the edge of downtown to far out into the countryside. 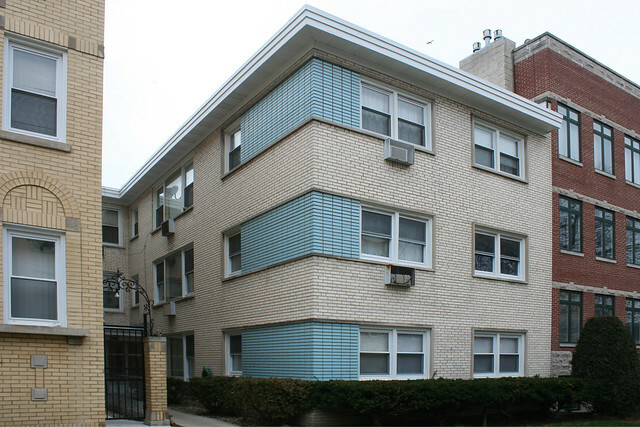 Along the way, it passes many neighborhoods and holds an almost endless parade of fascinating architecture – and so many terrazzo storefront floors that I was originally going to limit this post to Archer Avenue only. 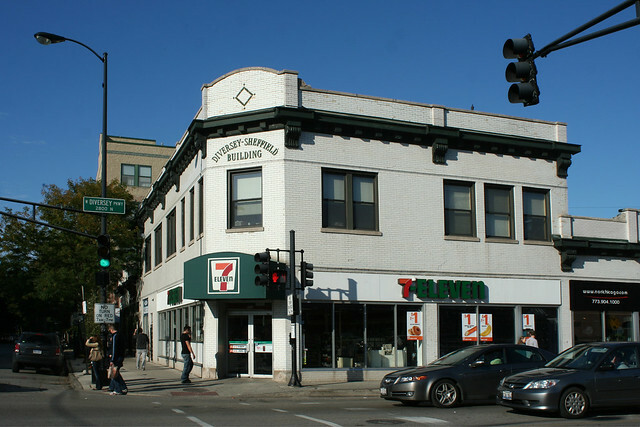 Brighton Specialty Shop – 4220 S. Archer Avenue – now Courrier Agency Insurance Group. This clothing store was in business here from 1942 to 1959, give or take. 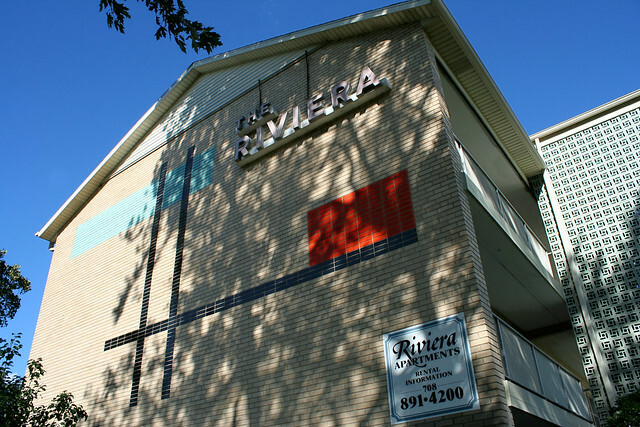 Sadly, this one’s days are numbered; the owner of the building’s current business plans to have the surface patched and repaired, then painted over with his company’s own logo. 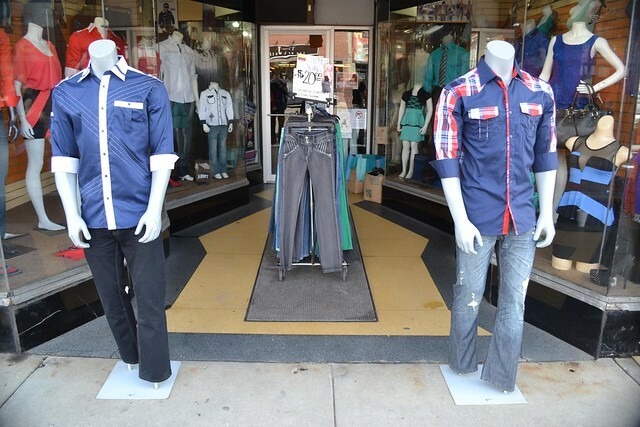 4241 S. Archer Avenue – Nu-Dell Apparel. The name is covered up by the welcome mat; the brick is newly applied. 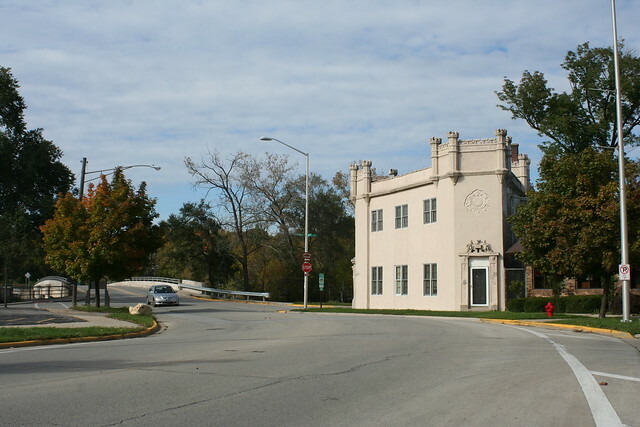 Nu-Dell operated here from at least 1935 to 1956. 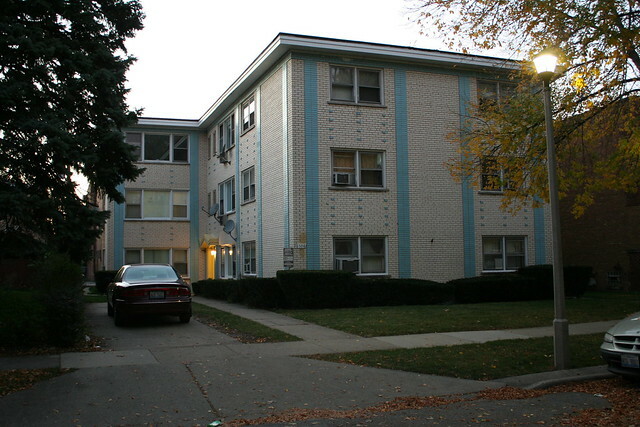 In the 1980s, Palatine Draperies was here. Today it’s home to Gabrielle’s, a florist. 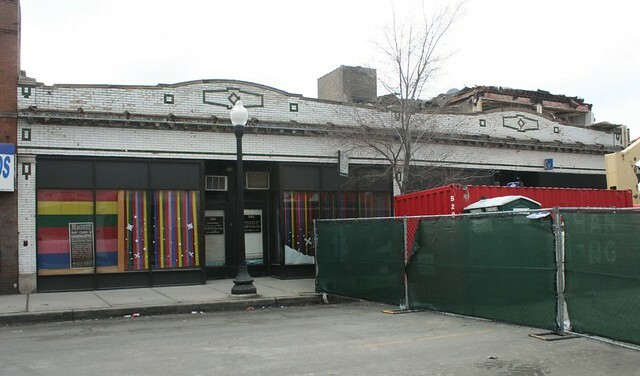 4271 Archer Avenue – originally a men’s clothing store, which only appears in the Tribune archives in a series of crime reports involving stolen clothing. Now an auto insurance company. 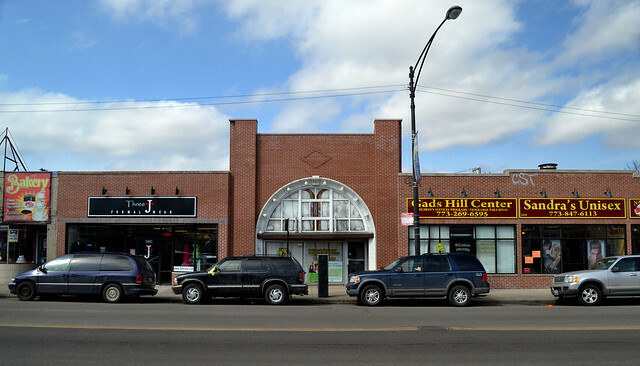 4243 Archer Avenue – originally Katz Exclusive Millenery, a local chain of women’s fashion accessory stores with several outlets around town, founded in 1921. 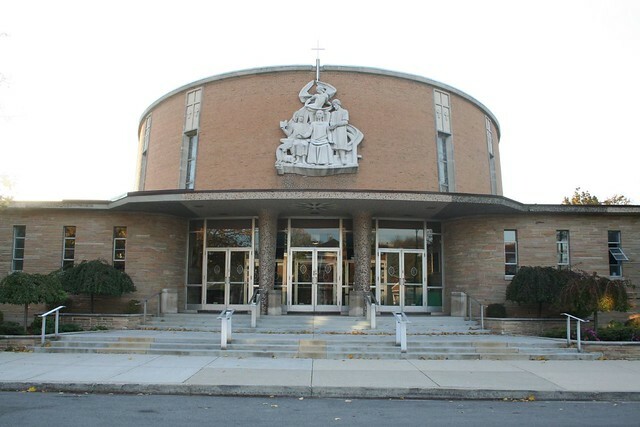 This location opened in 1944. Their run here lasted through the 1950s; Katz went out of business when its founder Samuel Katz retired in 1964. Now Lucy’s Women and Men’s Wear. 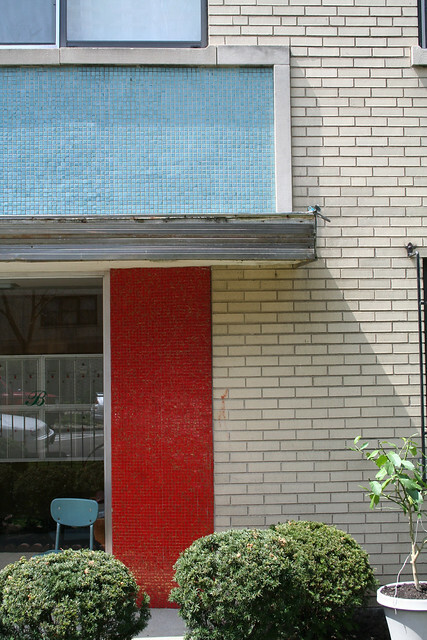 4249 S. Archer Avenue – A Mid-Century storefront marked by a stylized O shape in the pavement and lot of turnover in occupancy. It’s not clear who installed the entryway. 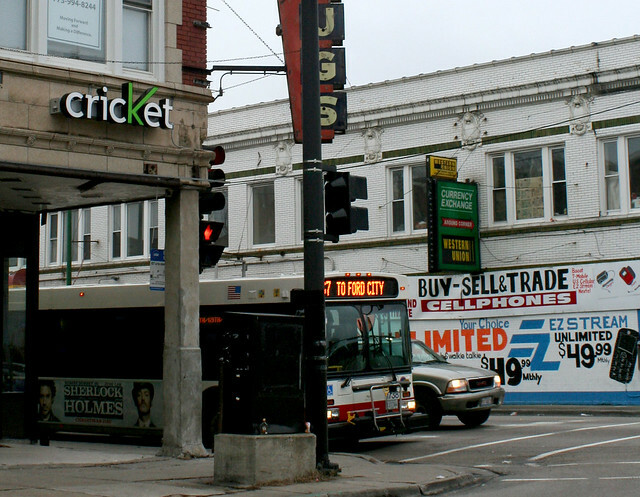 In 1929 it was Brighton Park Clothiers. 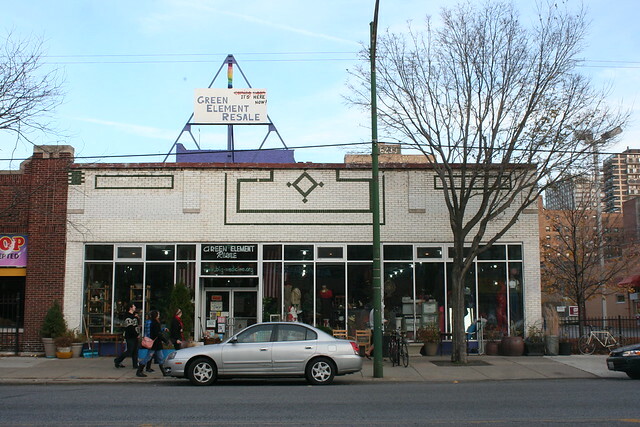 In the mid-1940s it housed a Spiegel catalog order store, followed by a Grayson clothing store starting around 1947. By 1960, Flagg Brothers Shoe Store; by 1972, O-Kay Shoes was here. 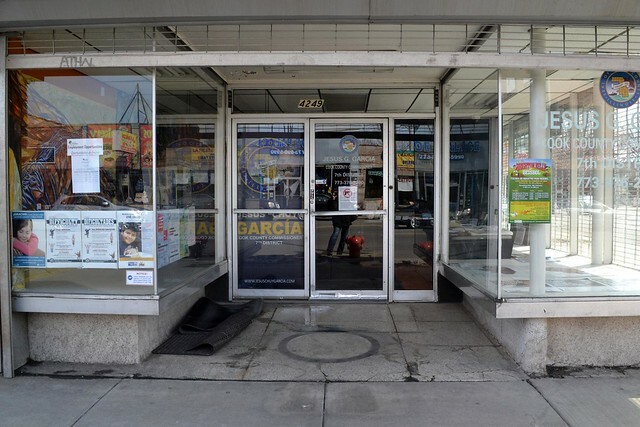 Today it’s the campaign headquarters of Jesus Garcia, Cook County 7th district commissioner. 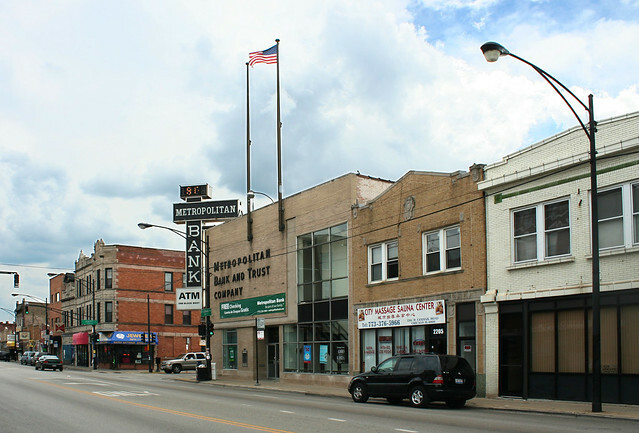 Archer Motor Sales – Established 1944 – 3945 S. Archer Avenue. W.K. 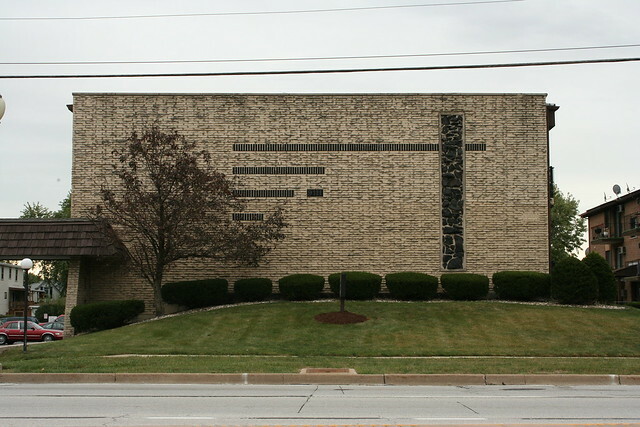 Archer Motor Sales was in business by 1926; in 1944 they relocated to this new building to sell Fords, lasting through 1957; the next year they were replaced by Power Ford Sales, Inc, who remained there until at least 1968. Now Image Hand Carwash and VP Real Estate. 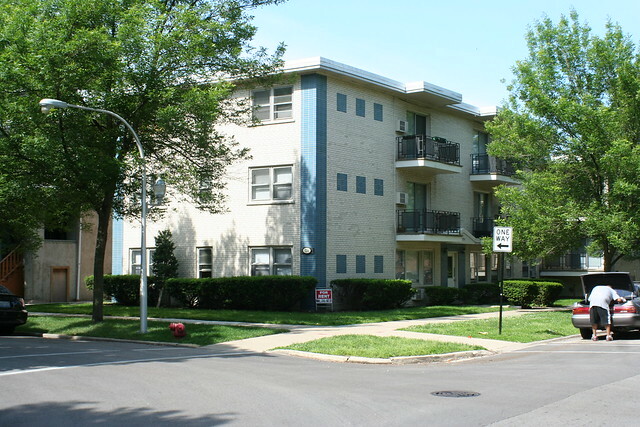 York – 4315 S. Archer Avenue. 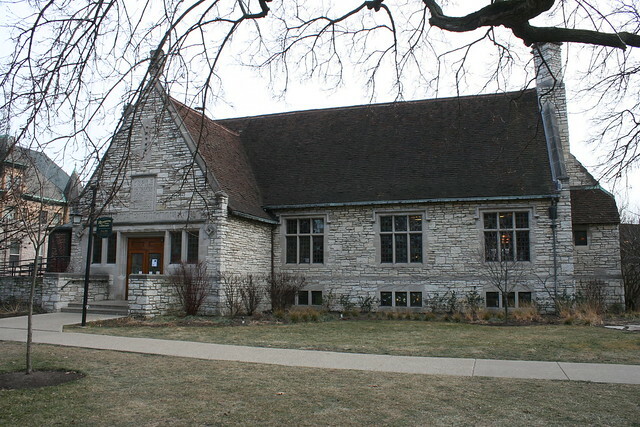 York Women’s Apparel moved in in 1947. 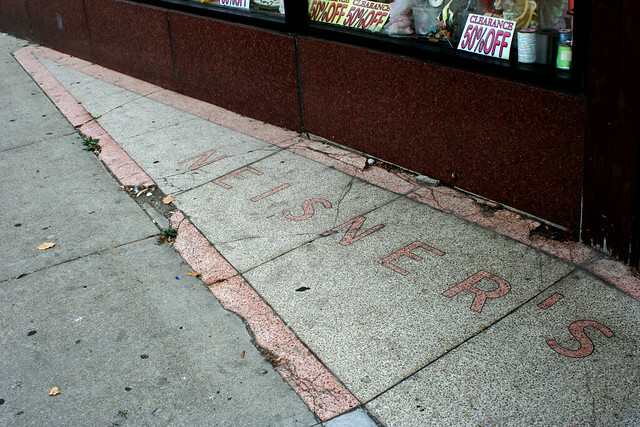 Today it’s conjoined with the building next door, which was an A&P grocer from the 1930s into the 1970s. Now Snow Discount Carpets. The font is a classic no-nonsense typeface used on many International Style buildings in the 1940s and 1950s. 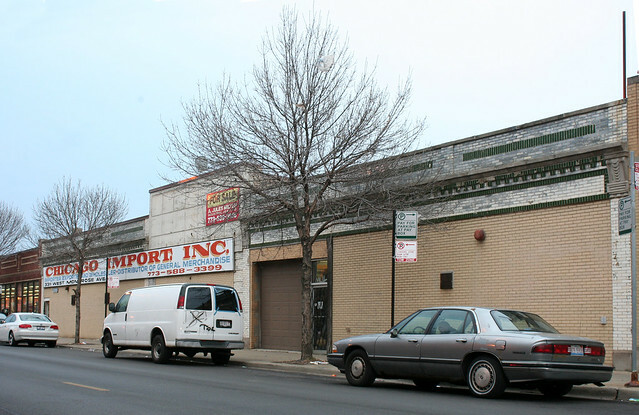 Archer Avenue Big Store – 4181-4193 S. Archer Avenue – originally a local department / dry goods store (with a given address of 4187 Archer) – founded in 1922, operating at this address by 1939, and still going 50 years later. 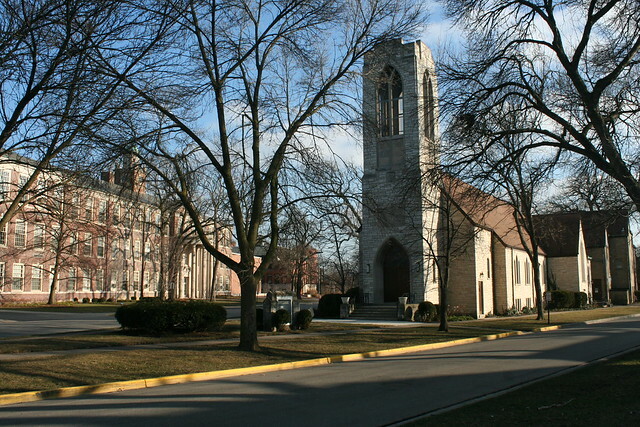 Founder John Brdecka passed away in 1990. The location is now Zemsky’s Uniforms. The stripes are adhesive anti-slip strips, not part of the original design. 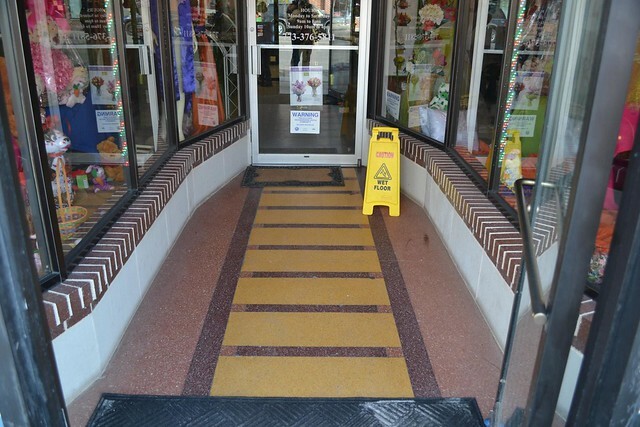 And finally, the quasi-famous entryway of Cushman’s on Broadway – proof that a terrazzo installation can outlast not only the business that commissioned it but also the building that housed it. 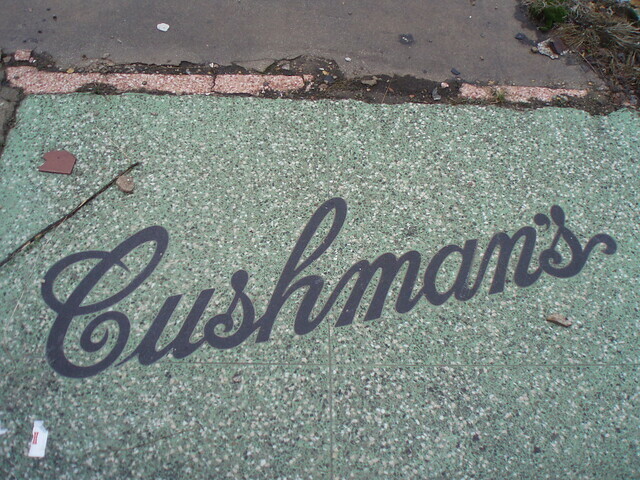 Cushman’s Rug Cleaners – 6310 N. Broadway – this carpet cleaning business moved in from a couple of blocks south around 1948. In 1971 a Cantonese restaurant named China Doll moved into the space; in 1984, Santino’s on Broadway, an Italian restaurant, moved in; in 1986, a nightclub called The 86 Club; by 1987, it was back to Chinese with the Bik Har restaurant and lounge. Some post-1990 disaster leveled half the block. 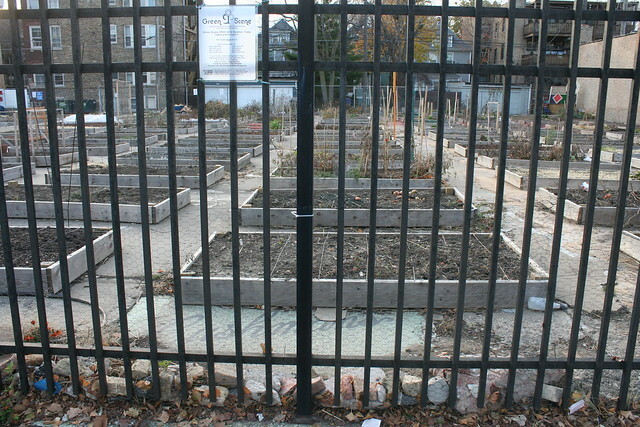 In the last few years, a community garden has sprouted up on the slab of the demolished building. 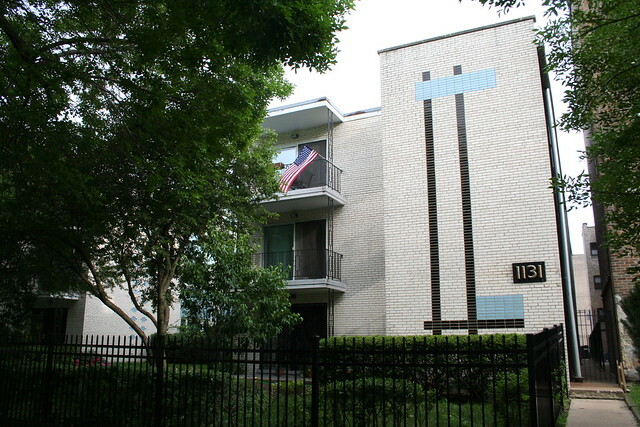 Terrazzo entries leave no clue as to their creators. Plenty of contracting and flooring companies could install them, and there’s no evidence regarding who did what job – though it seems possible that several of the more stylish ones may have come from a single designer. I am acutely aware that this is a rather woefully incomplete list, but as they say, sometimes you go to blog with the photos you have, not the photos you wish you had. I don’t have shots of some of Chicago’s most interesting and impressive terrazzo installations, including the “What Petersen Promises, Petersen Does” on Belmont, the Art Deco patterns on the patio of the Davis Theater, and any number of the entries on this Flickr set, which includes some real beauties both in Chicago and elsewhere. If you need an excuse to take a long stroll when the weather lets up, head out to one of the city’s grand commercial streets and treat yourself to a day of terrazzo hunting.